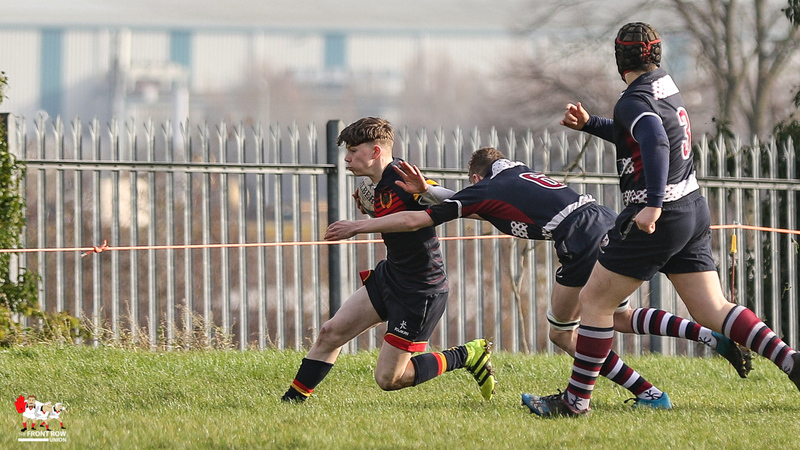 Enniskillen try scorer Quilin Irvine attacks the Larne line. 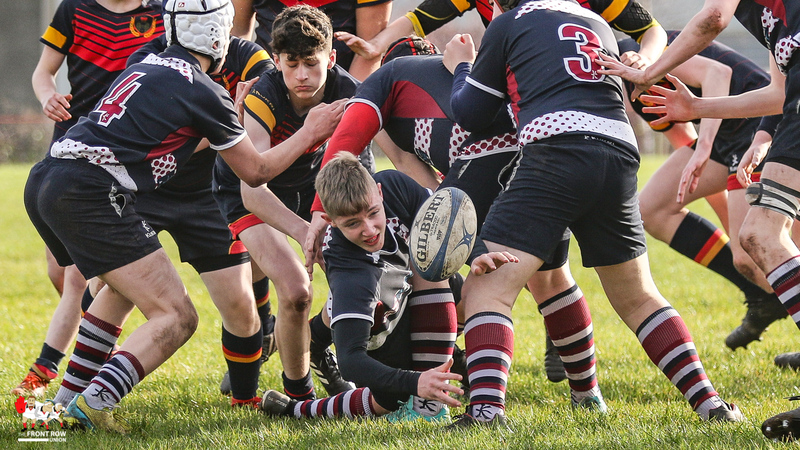 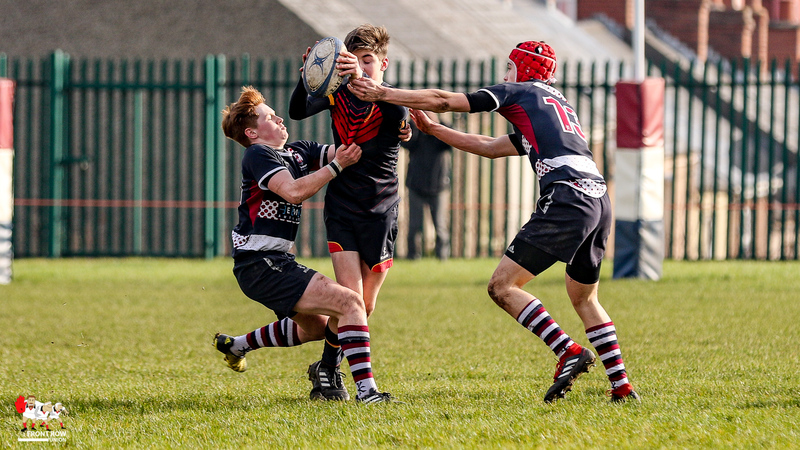 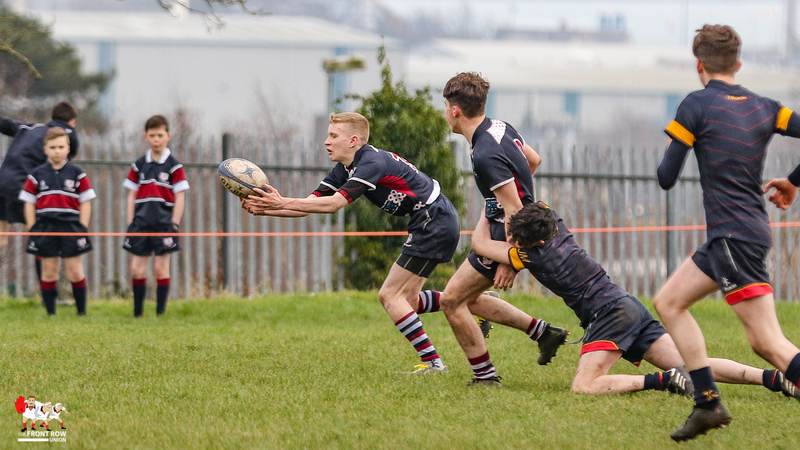 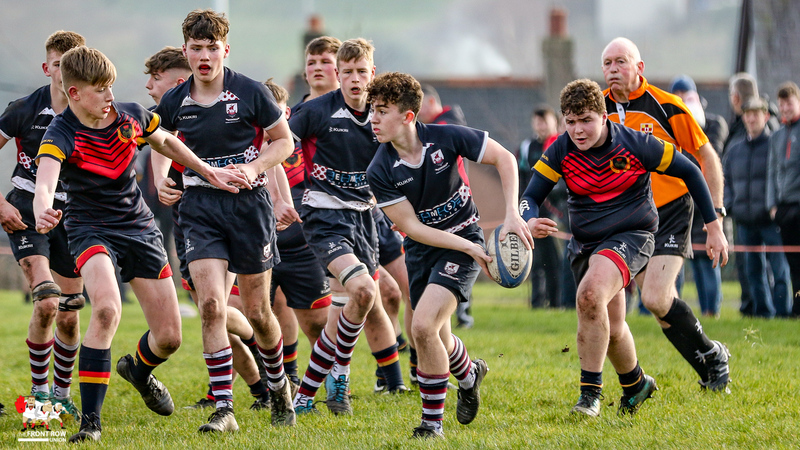 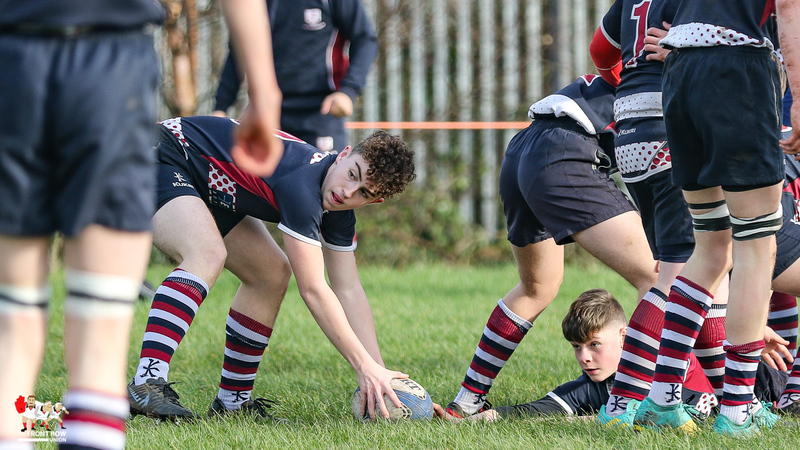 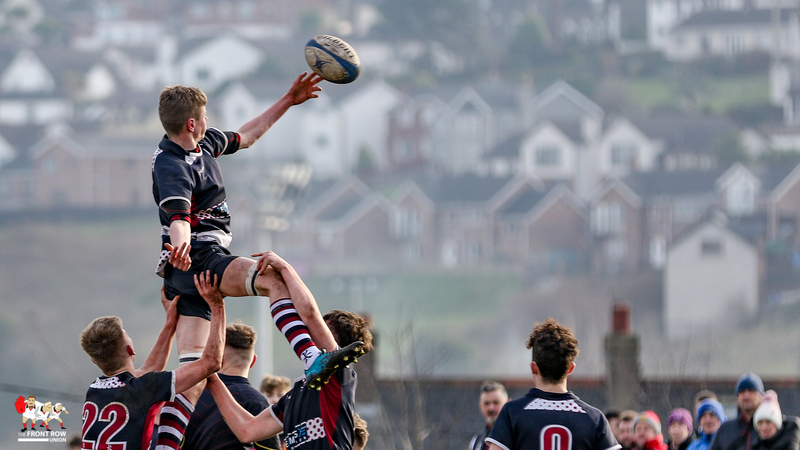 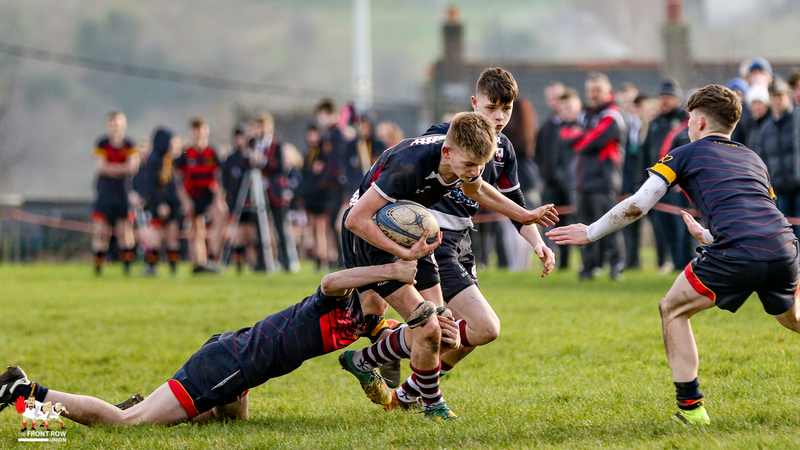 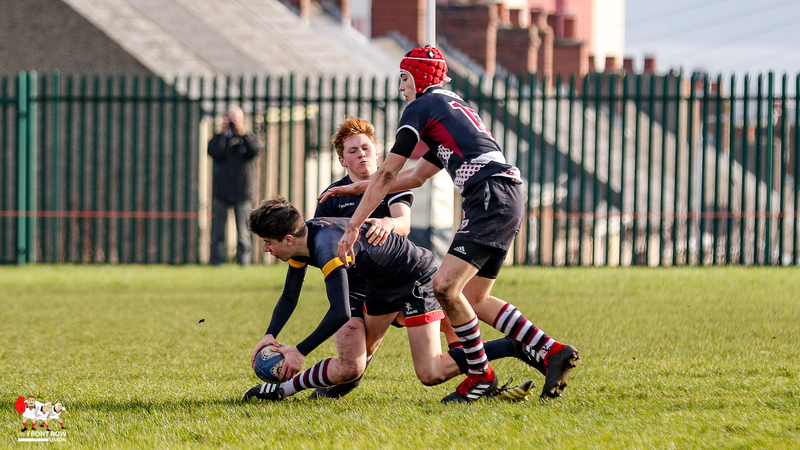 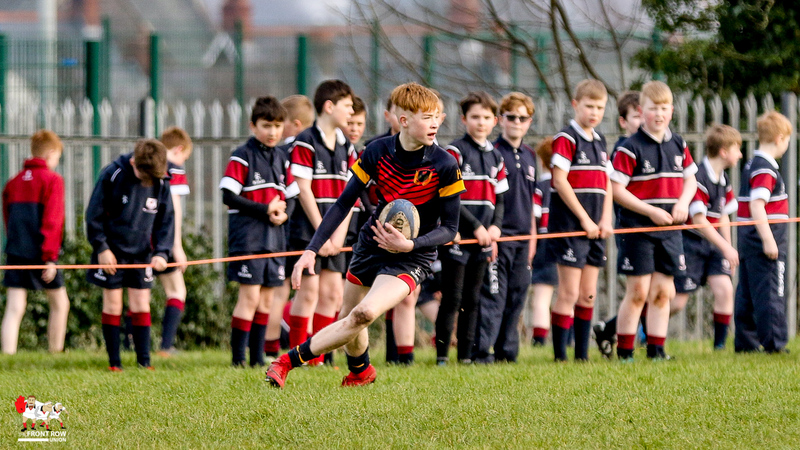 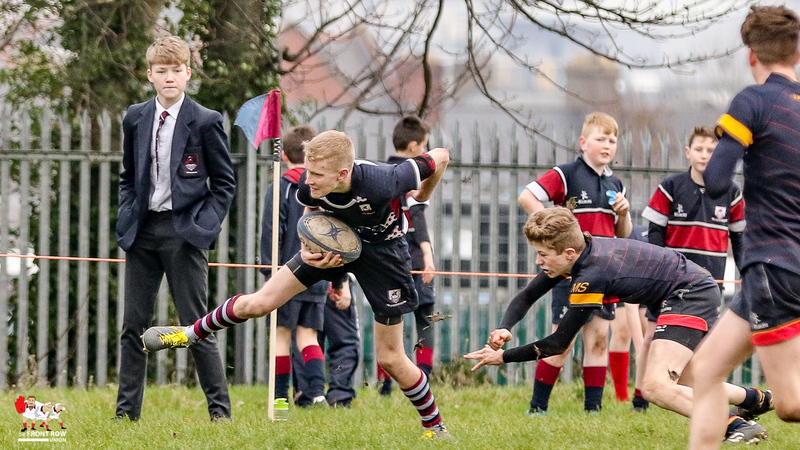 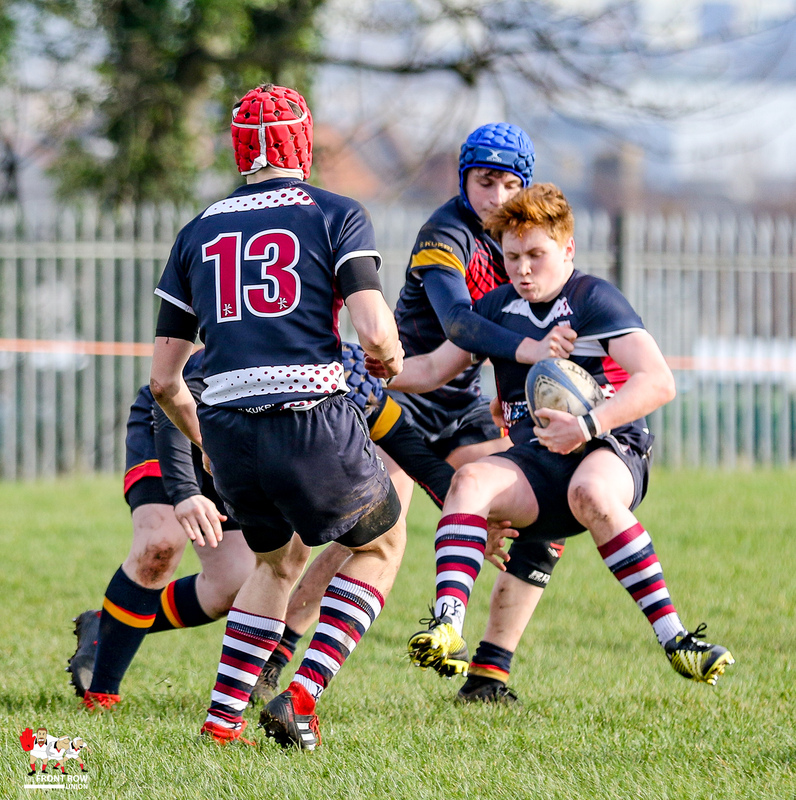 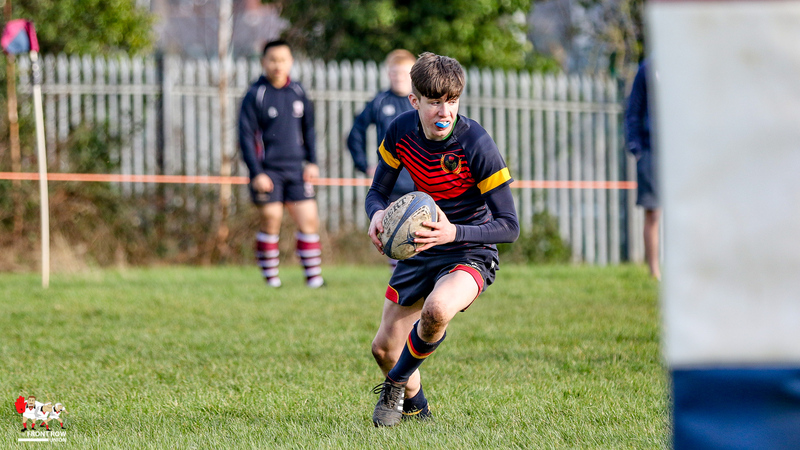 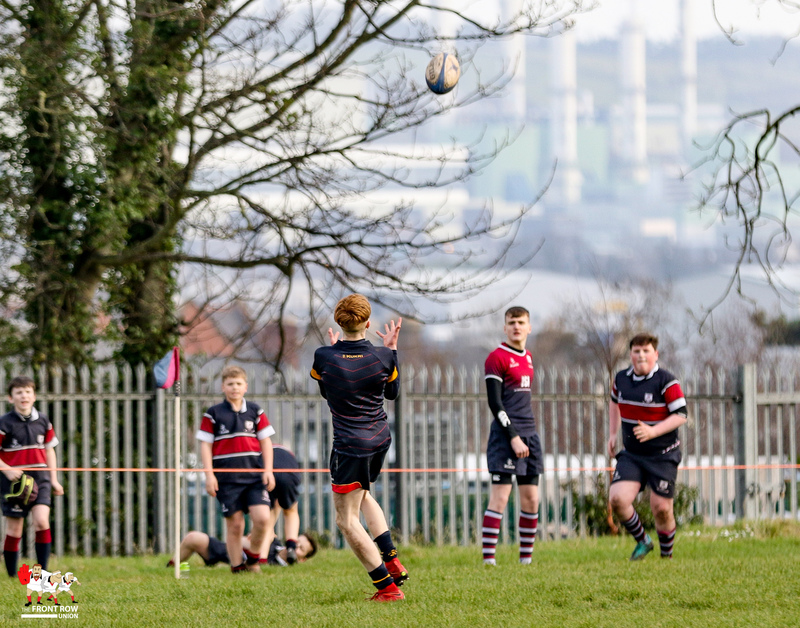 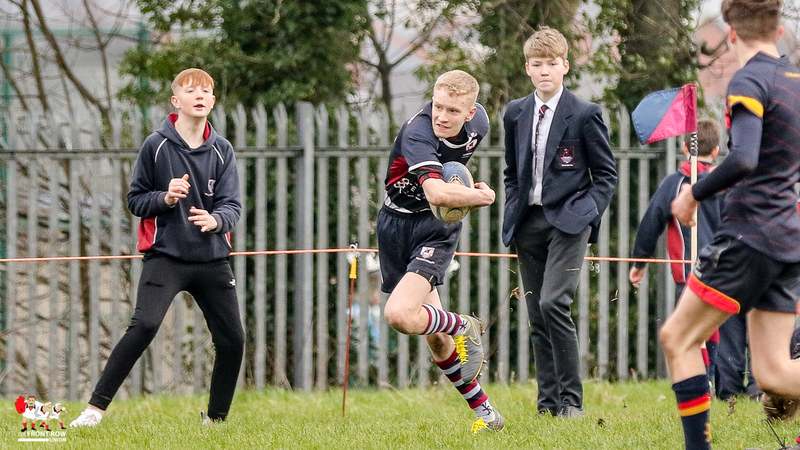 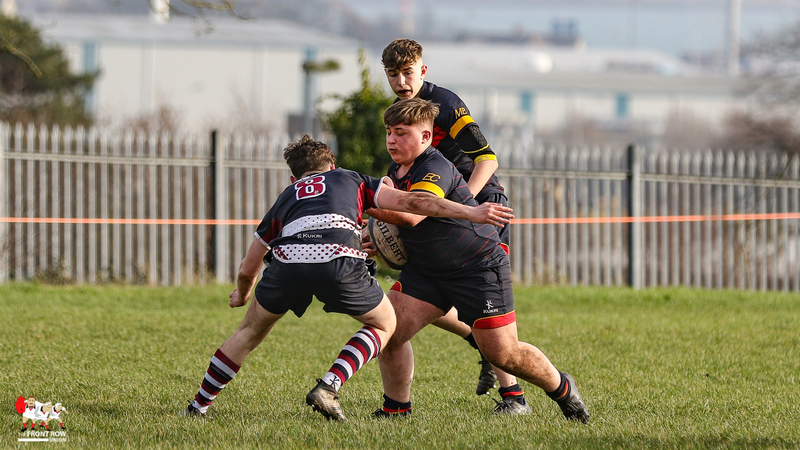 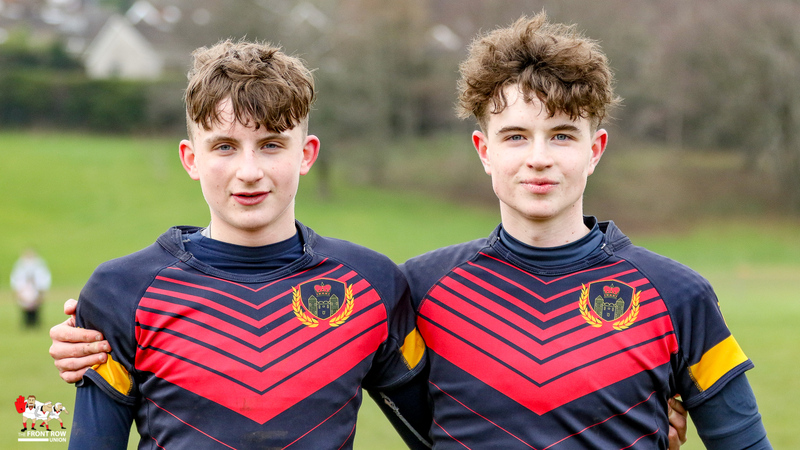 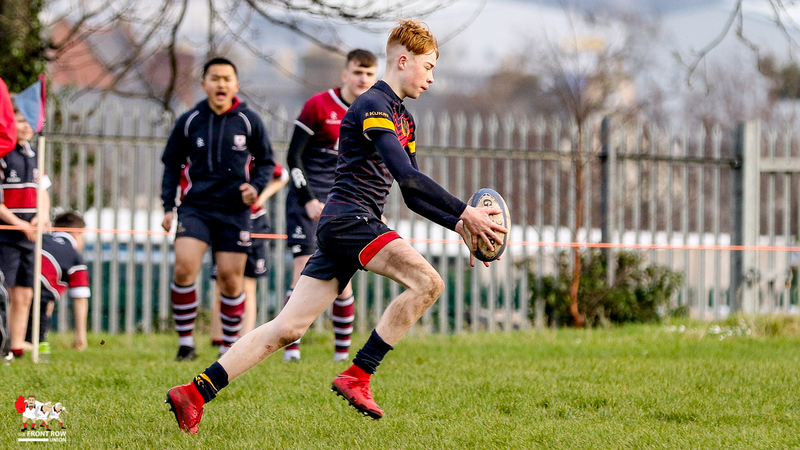 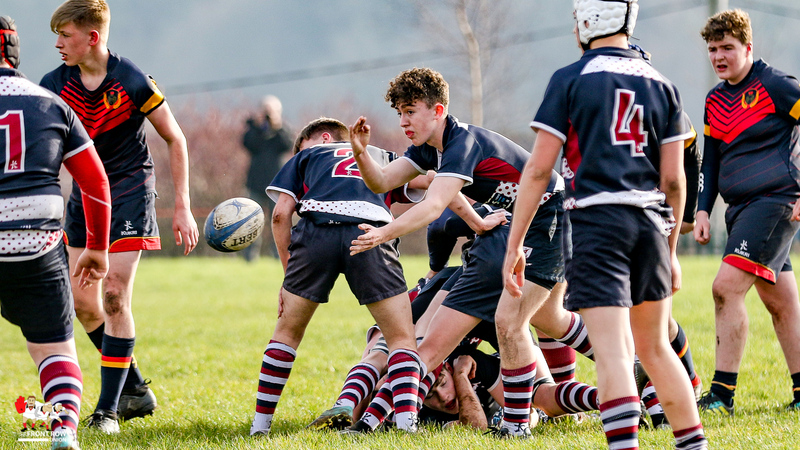 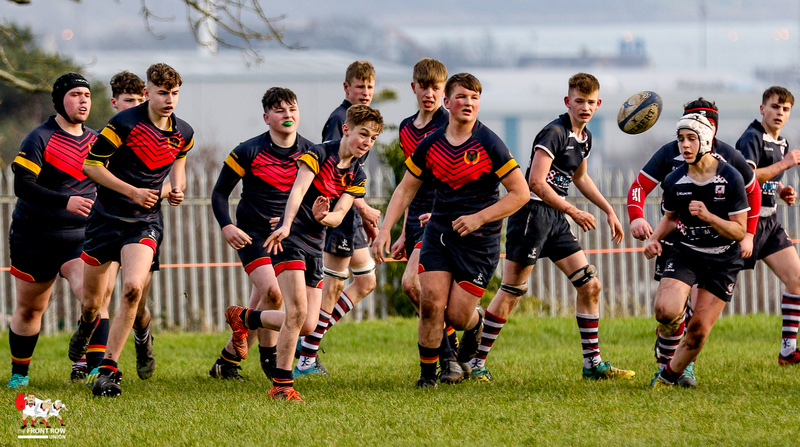 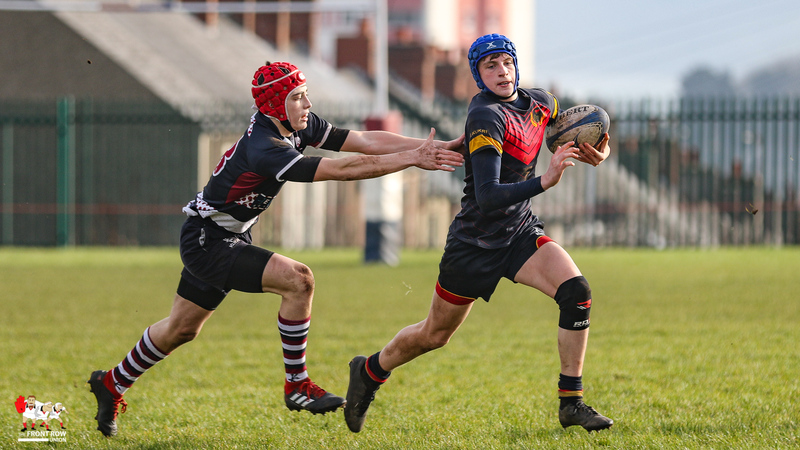 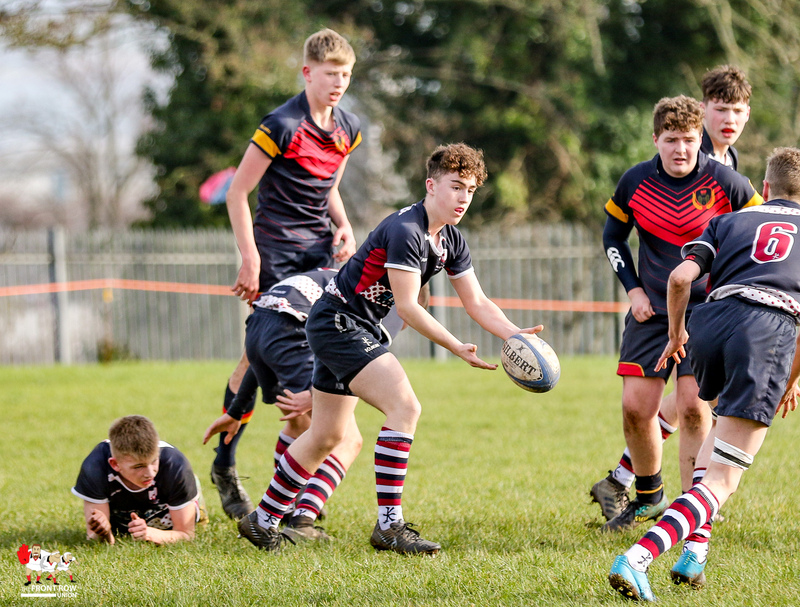 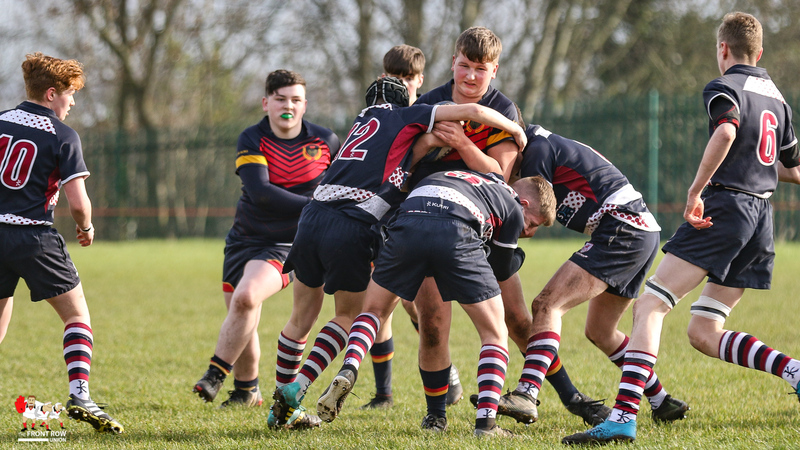 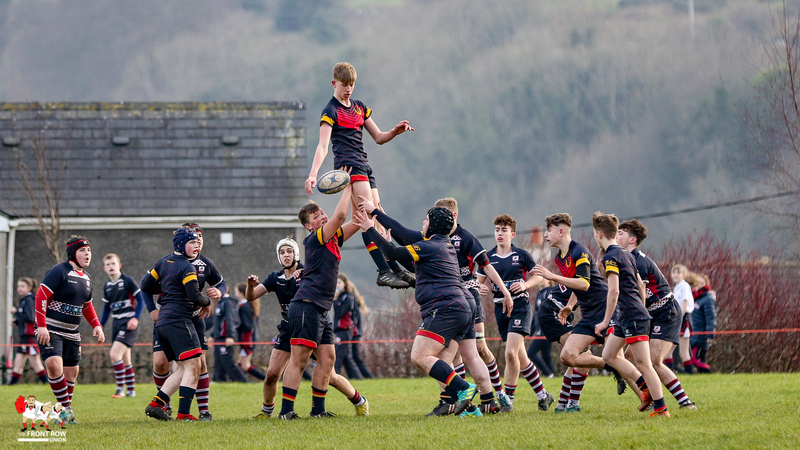 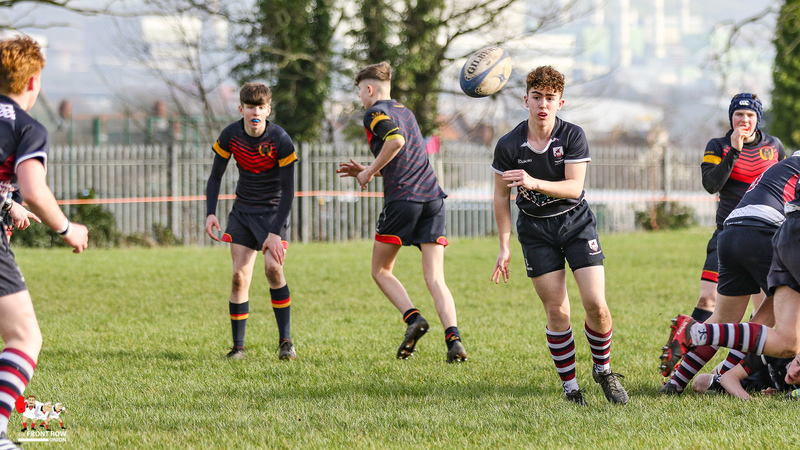 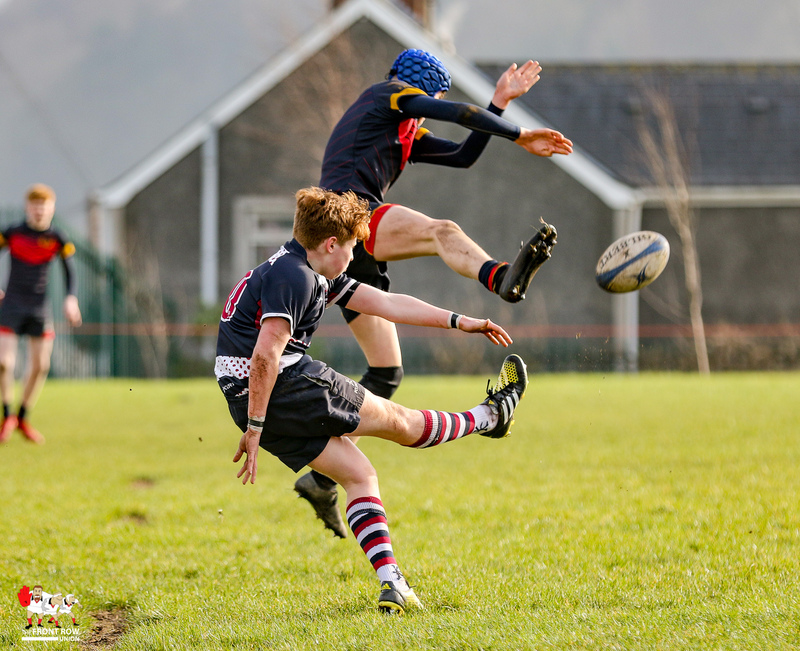 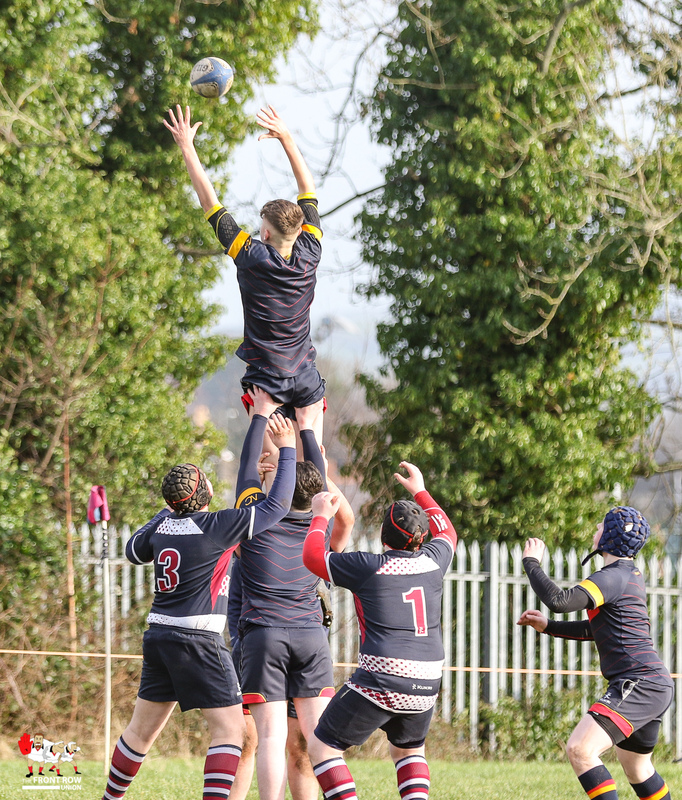 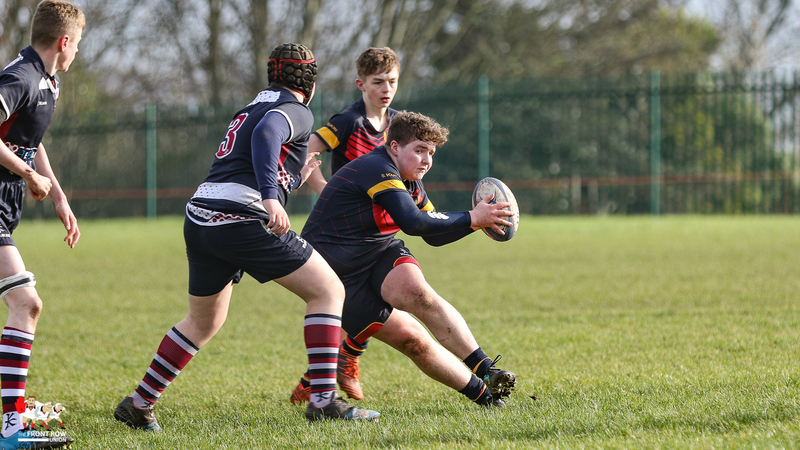 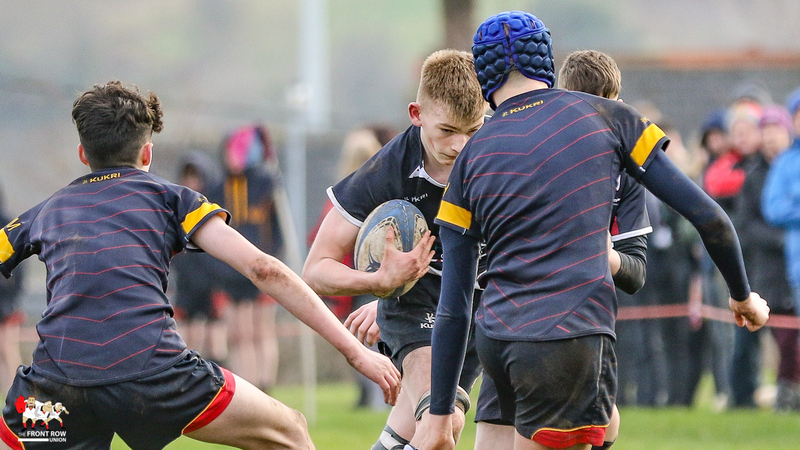 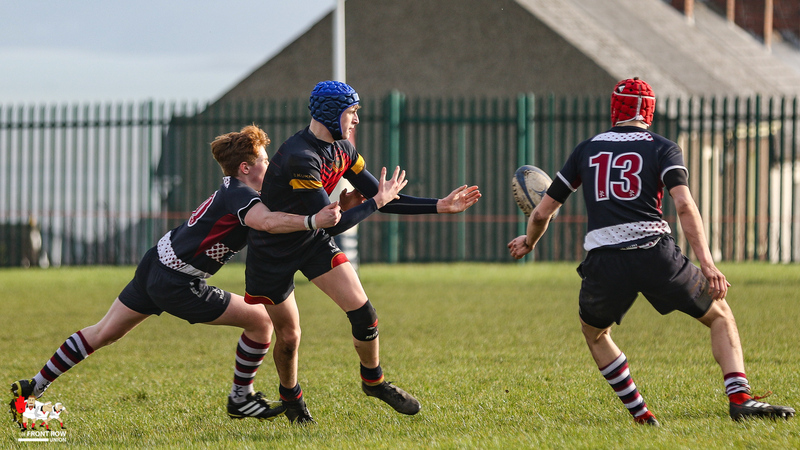 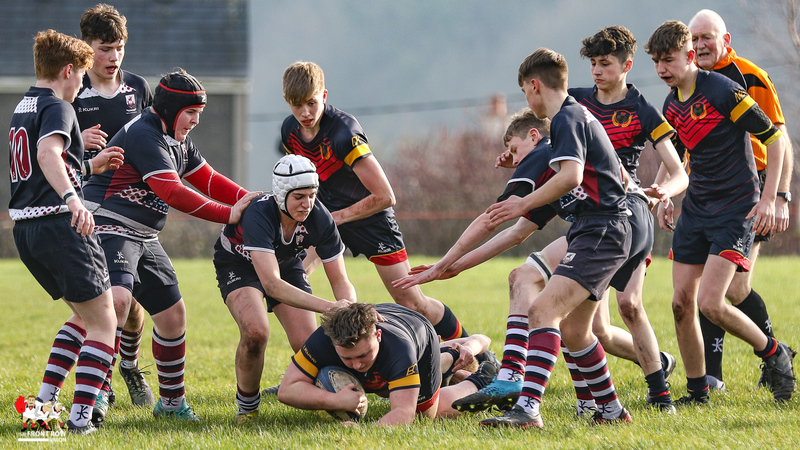 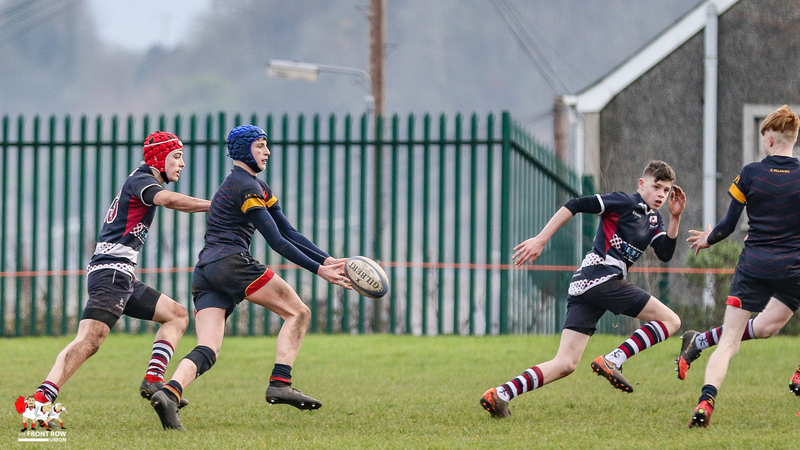 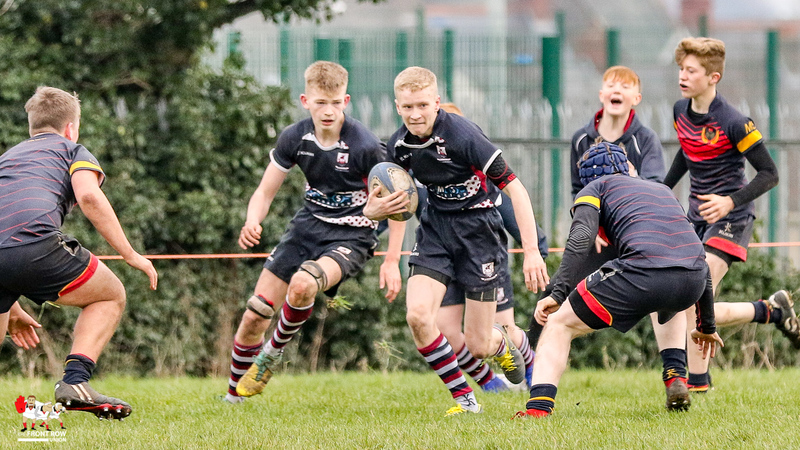 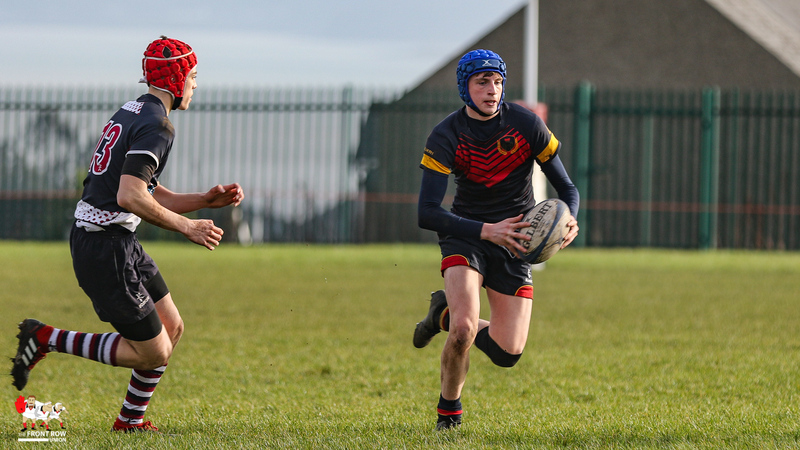 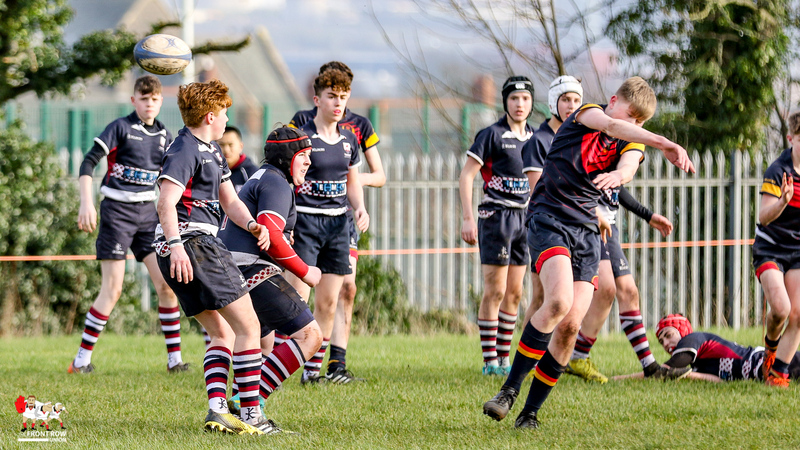 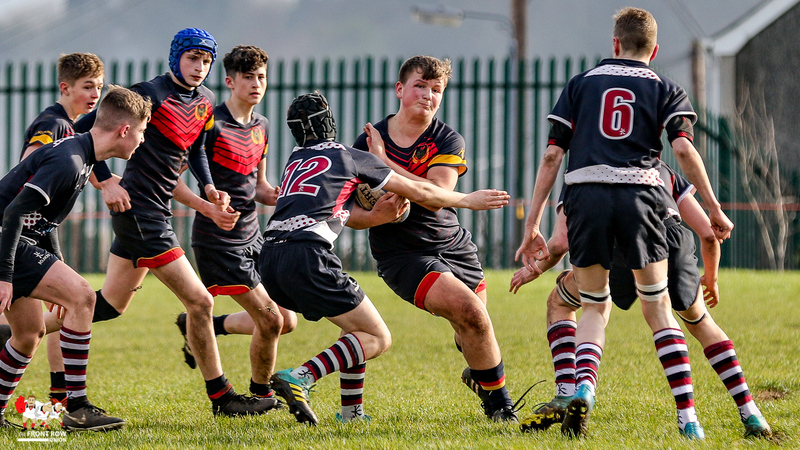 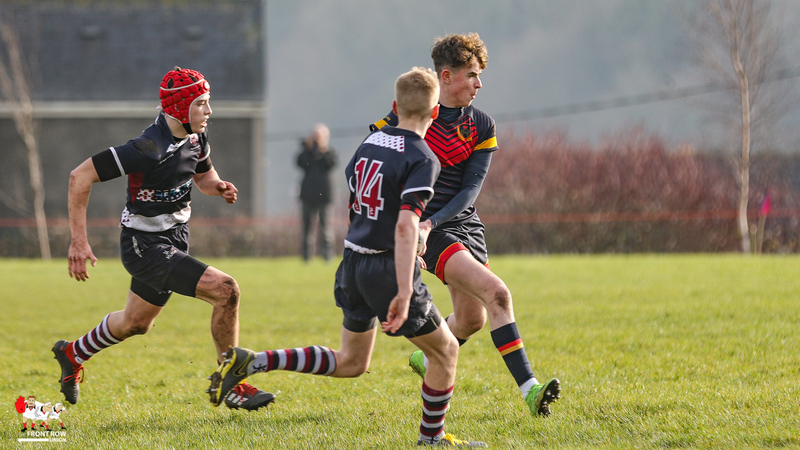 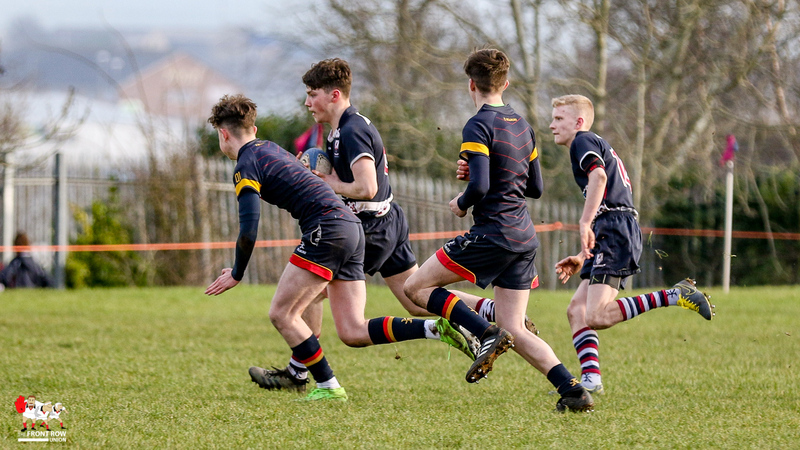 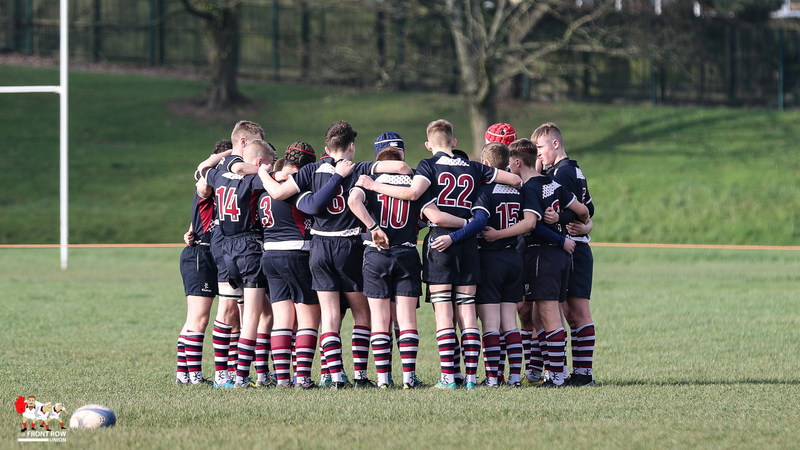 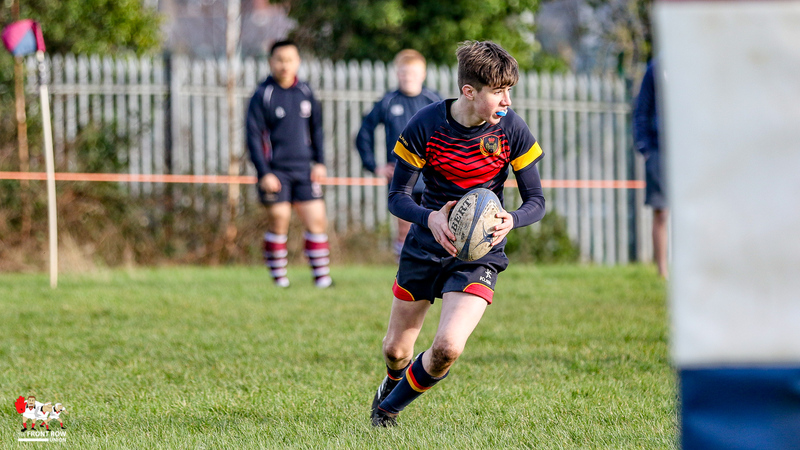 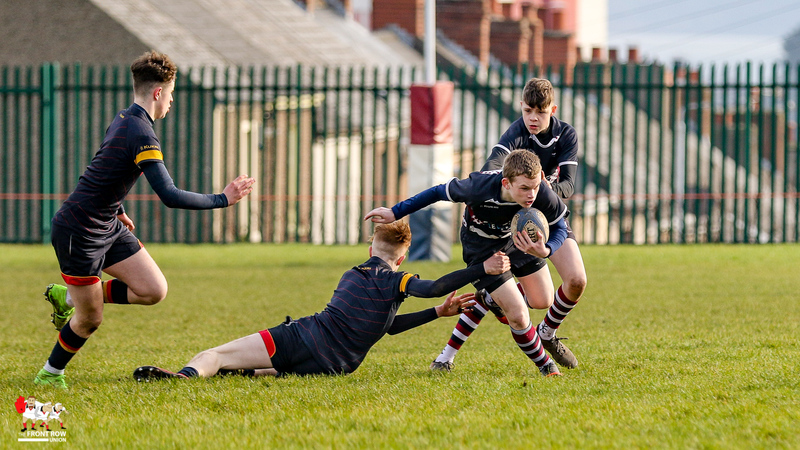 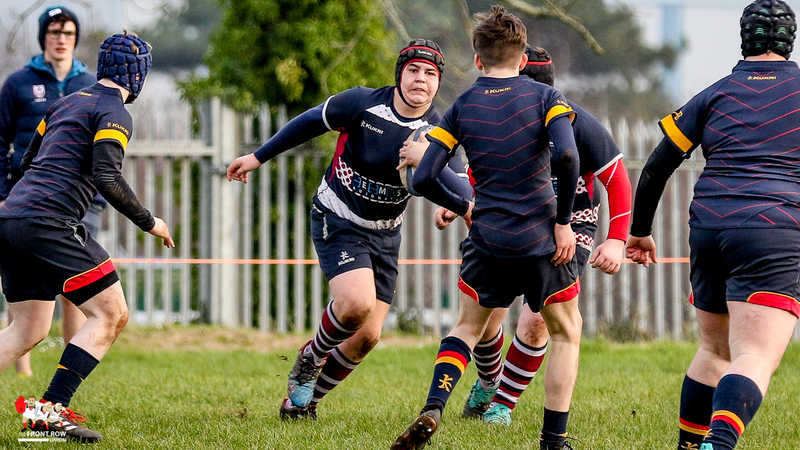 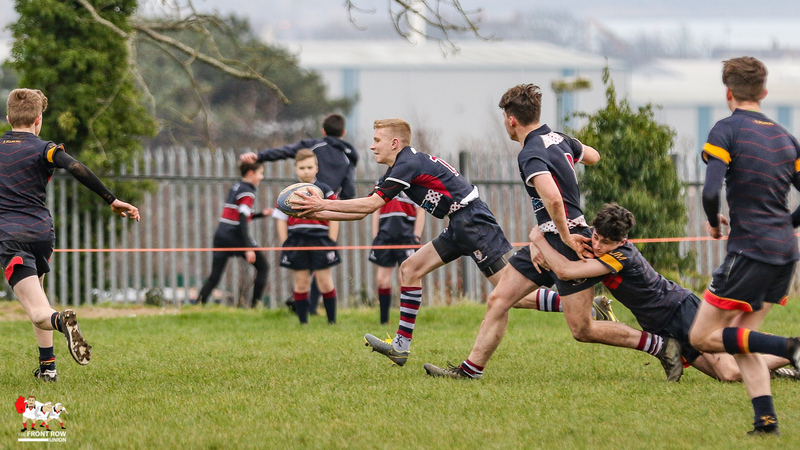 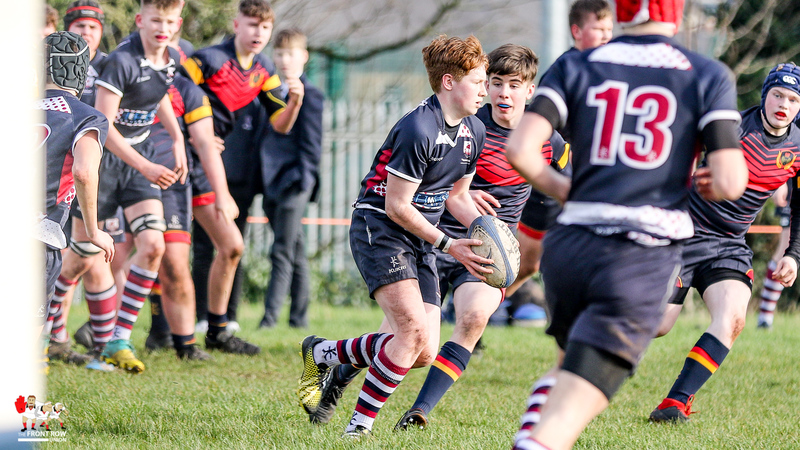 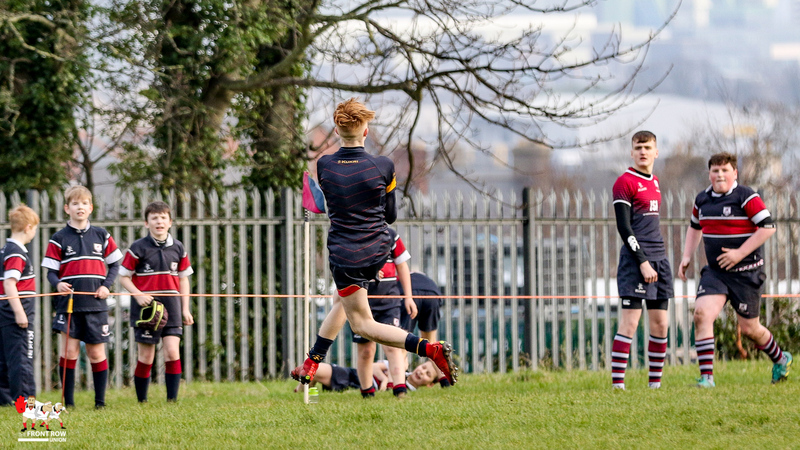 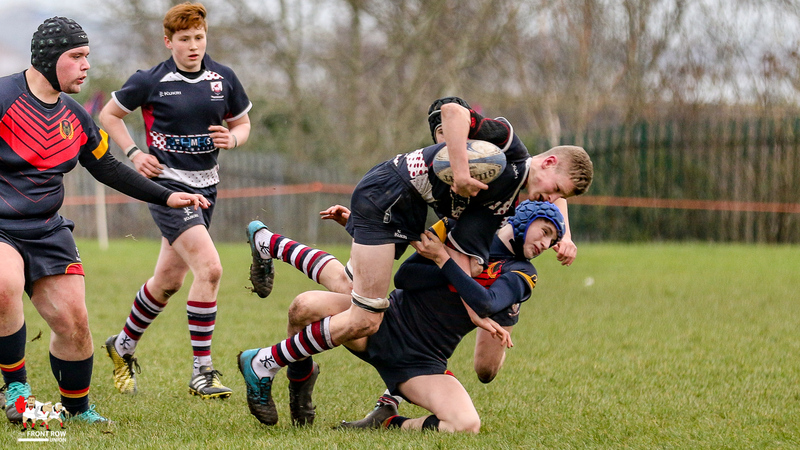 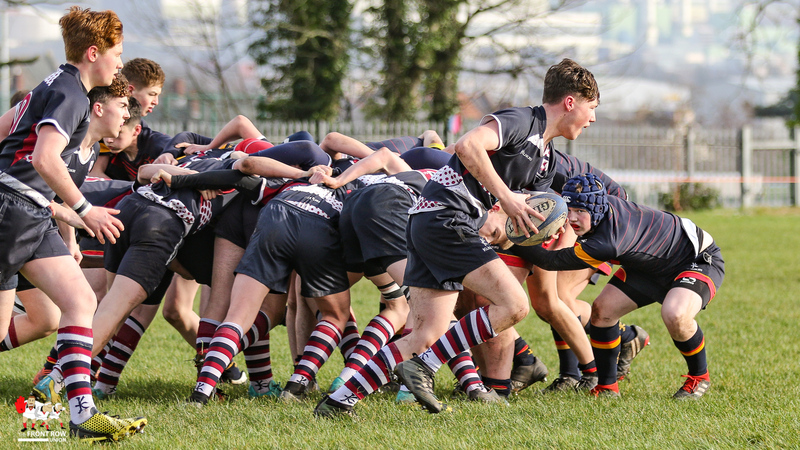 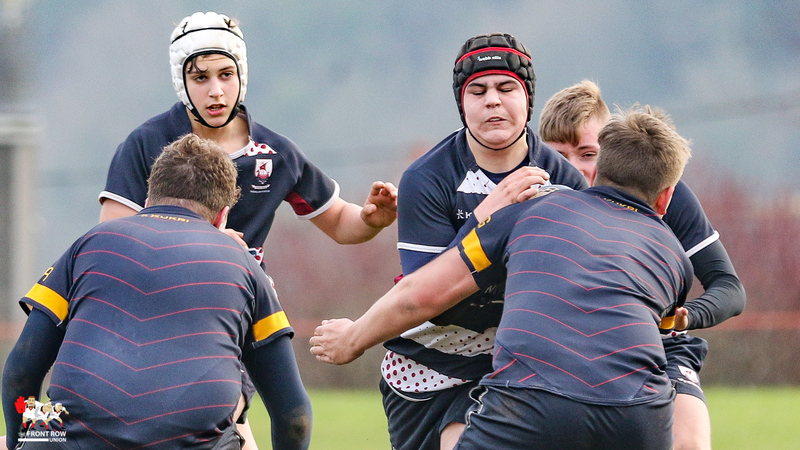 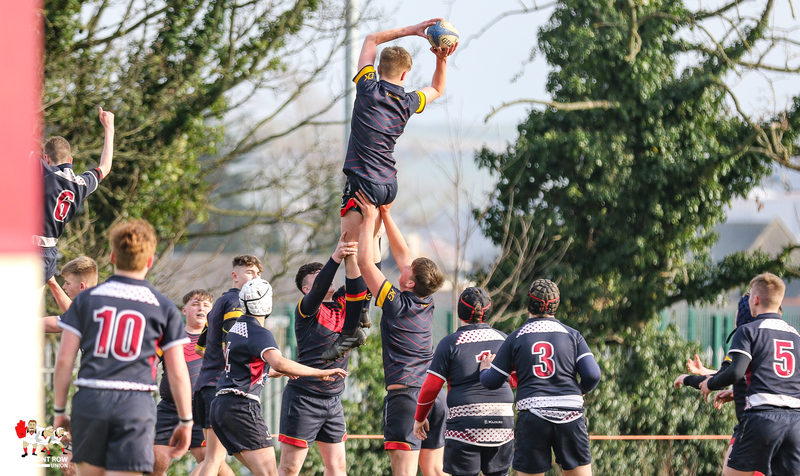 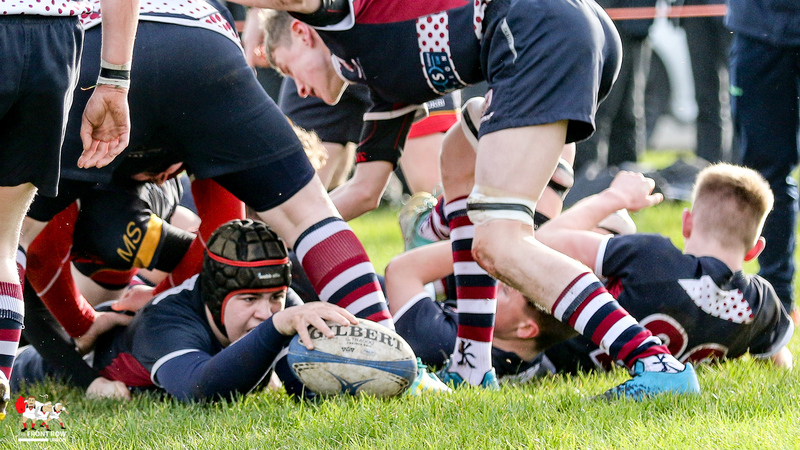 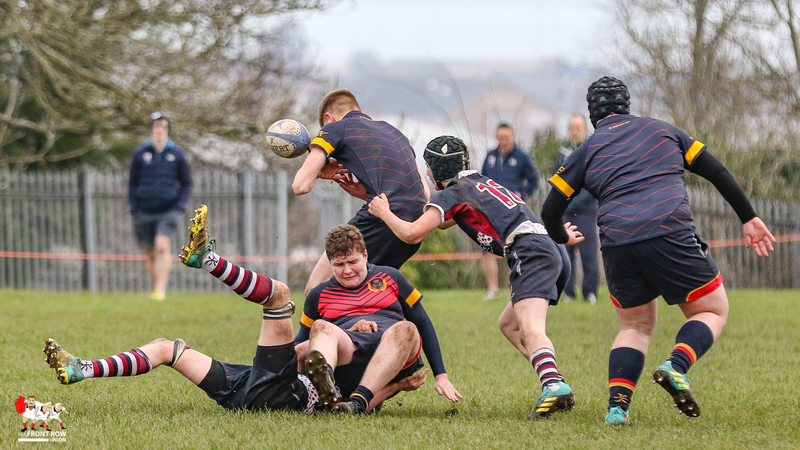 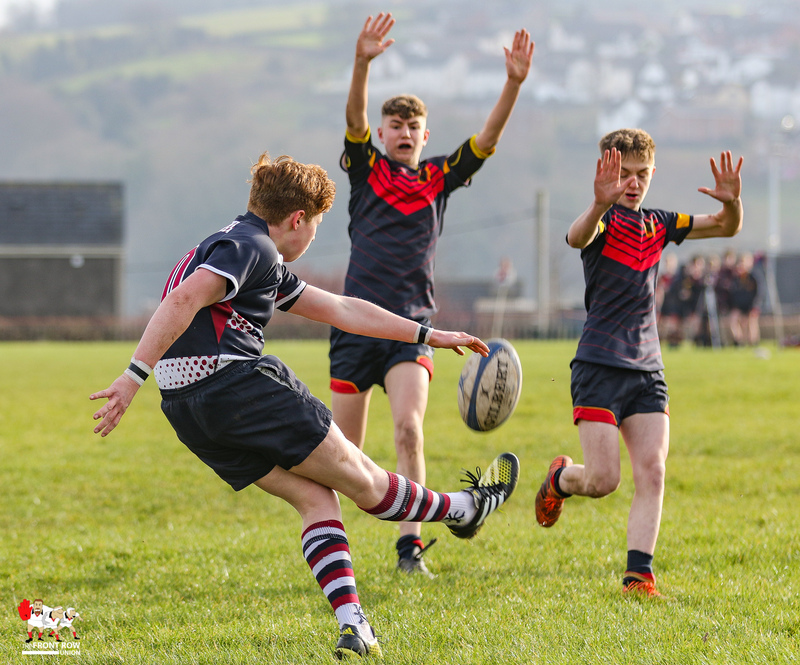 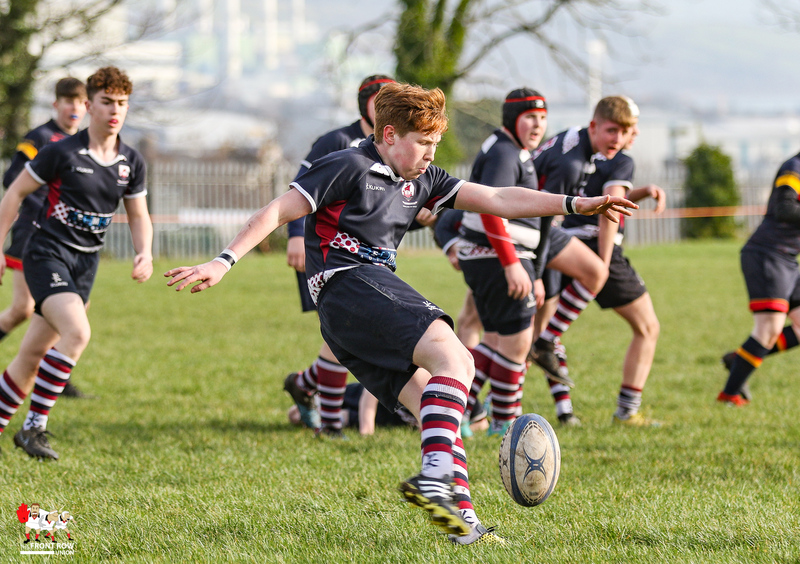 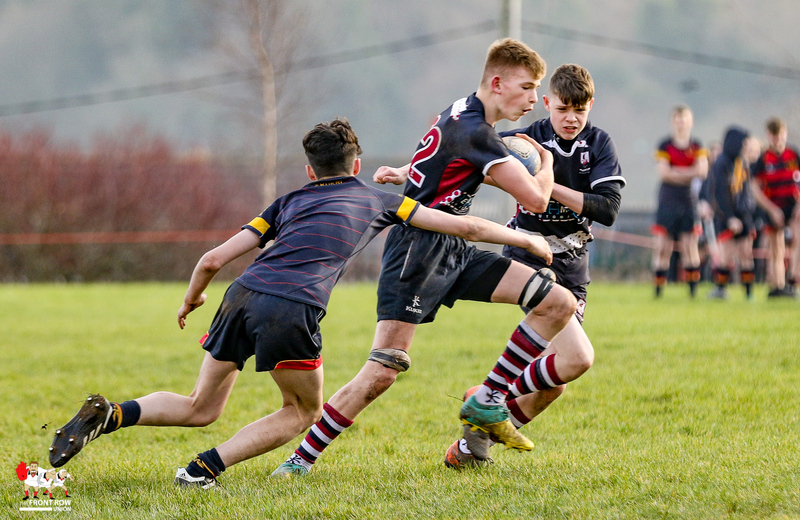 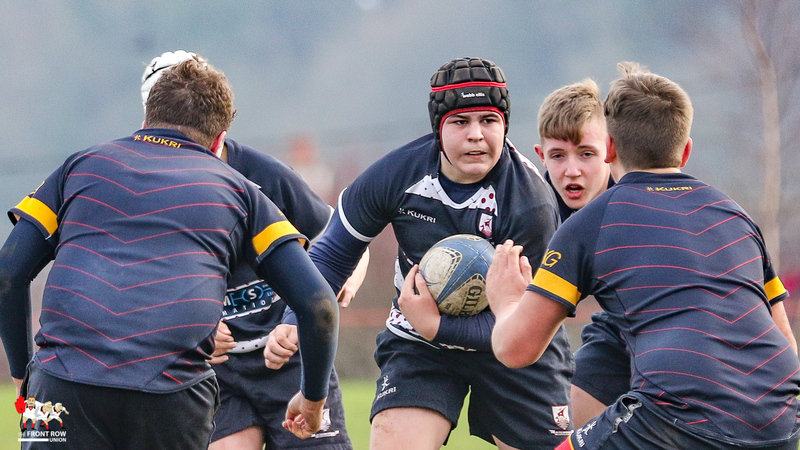 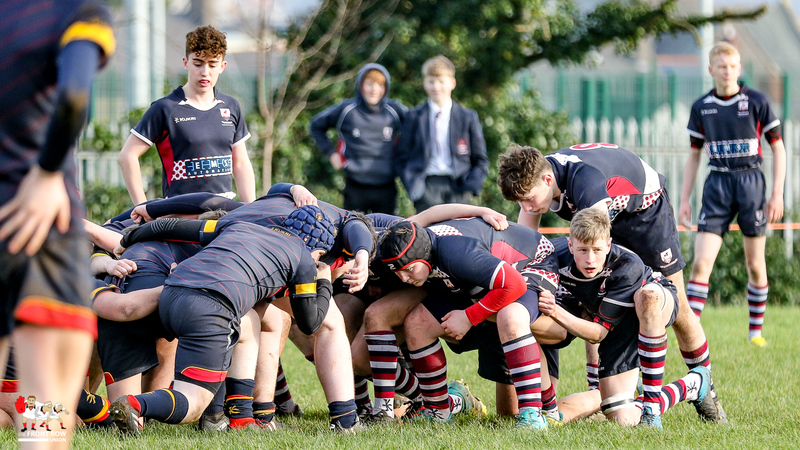 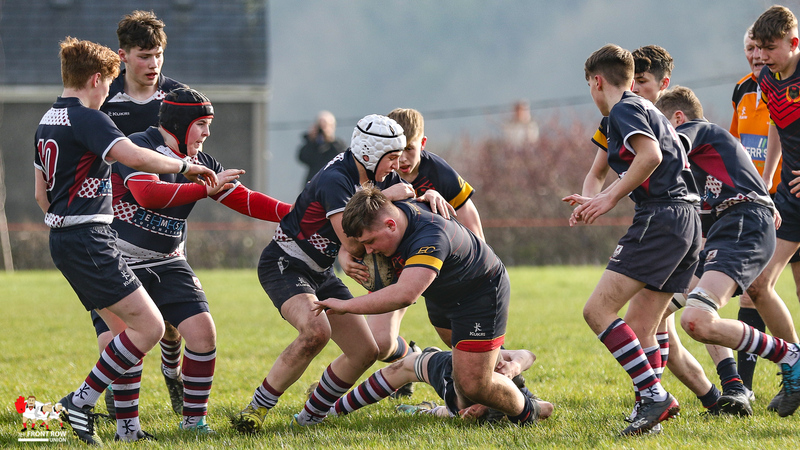 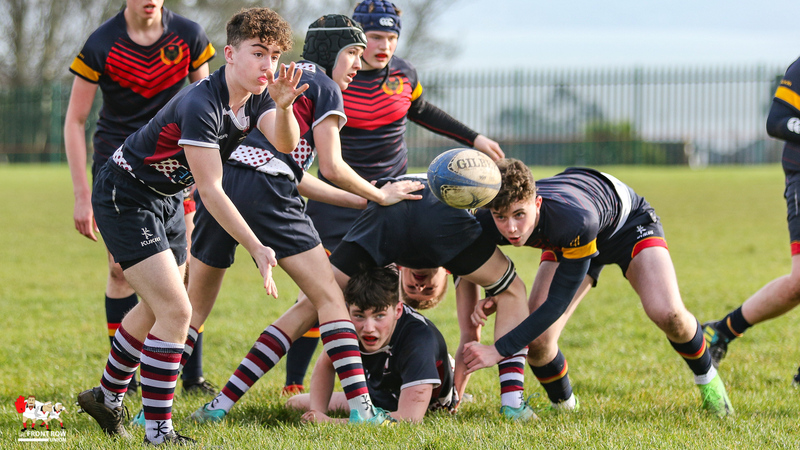 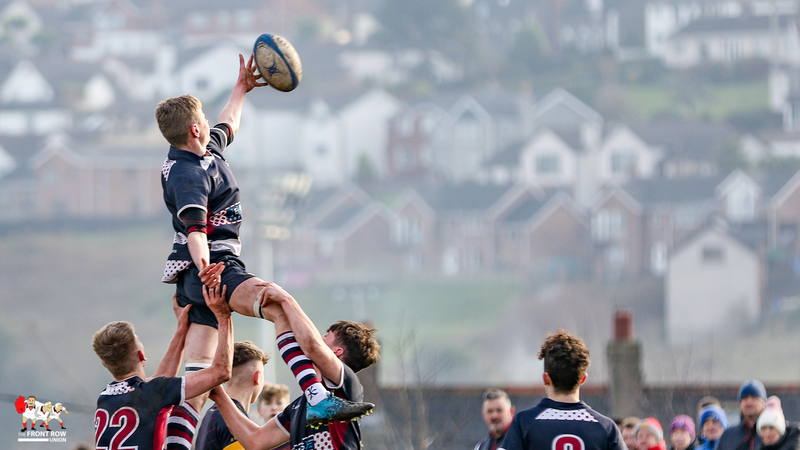 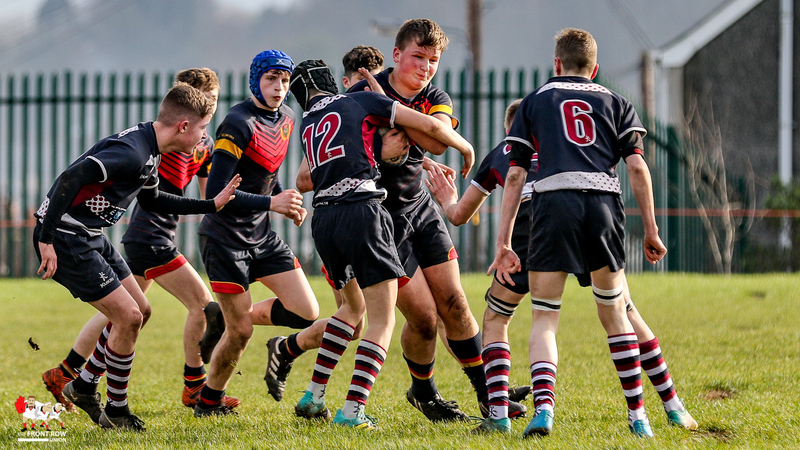 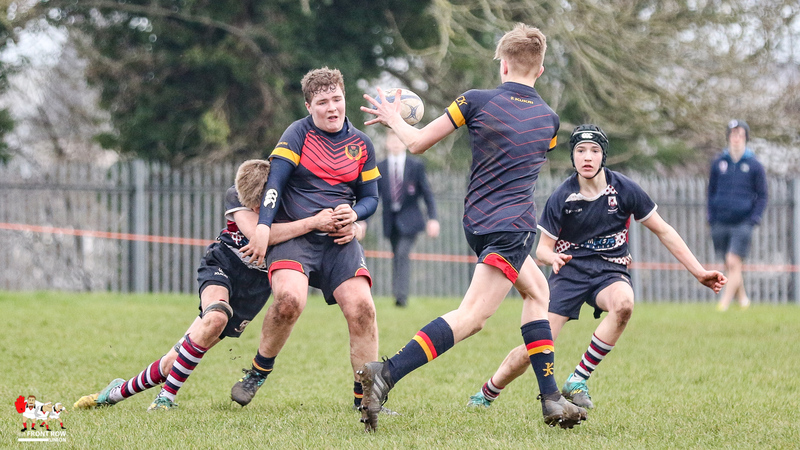 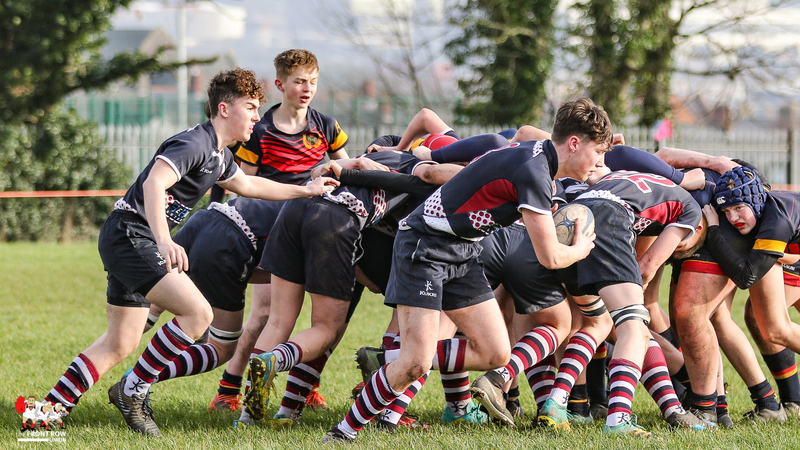 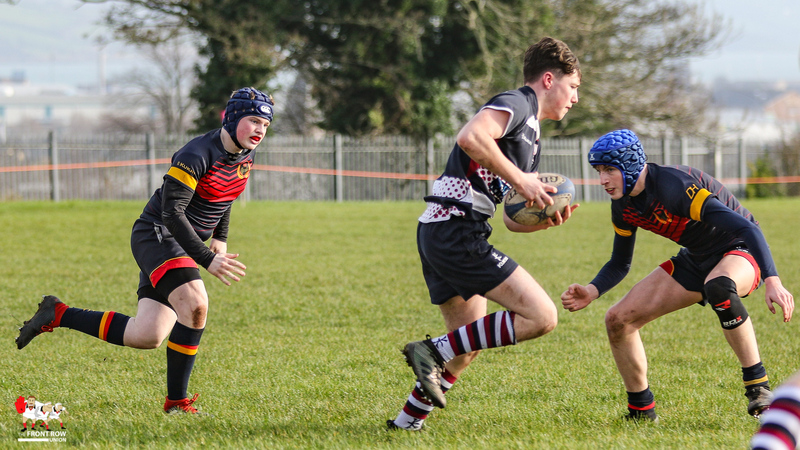 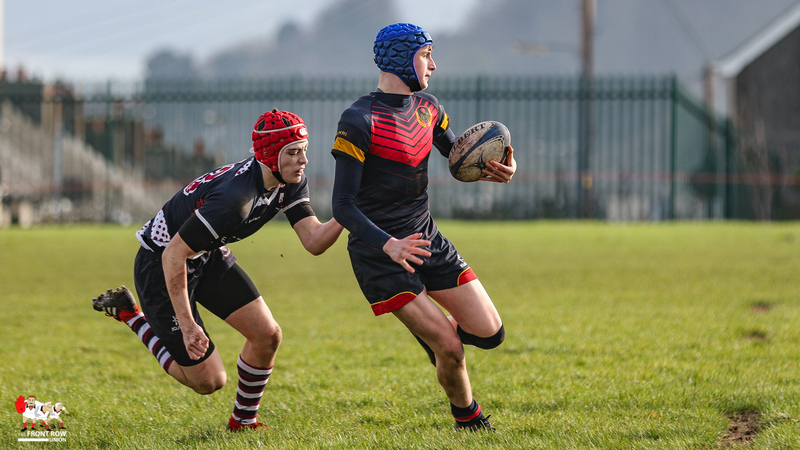 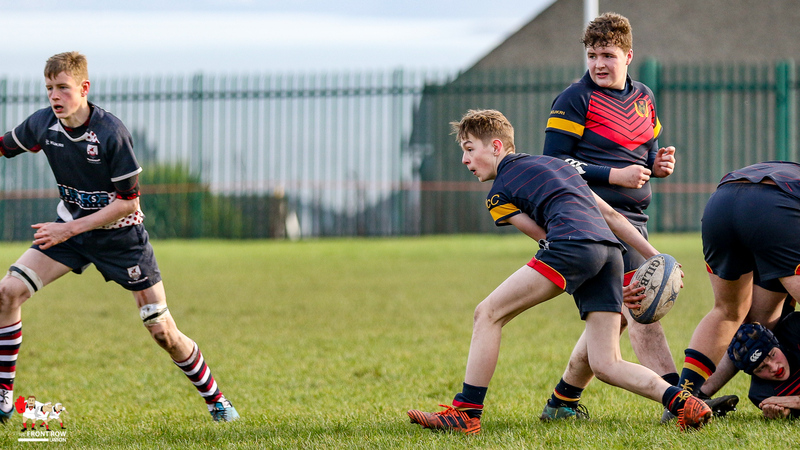 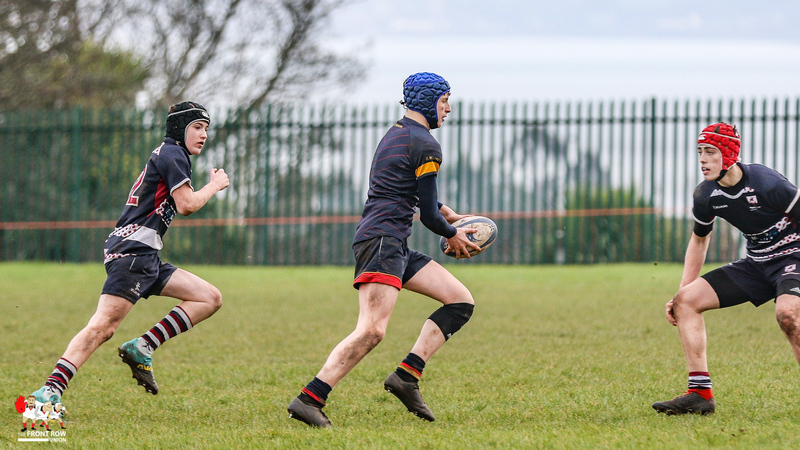 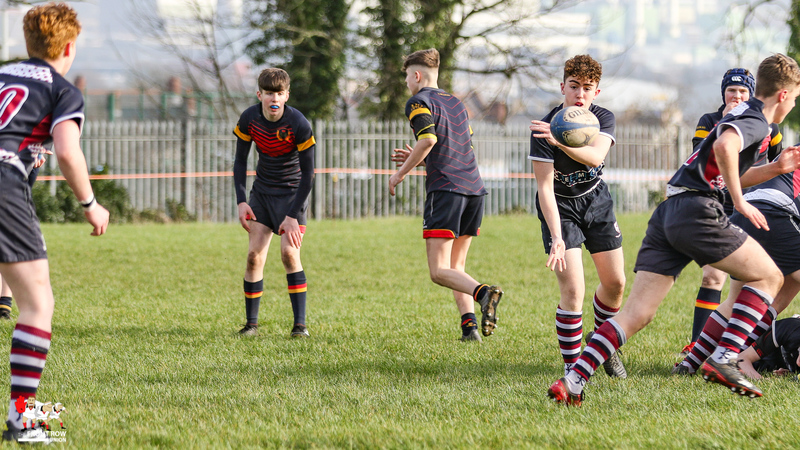 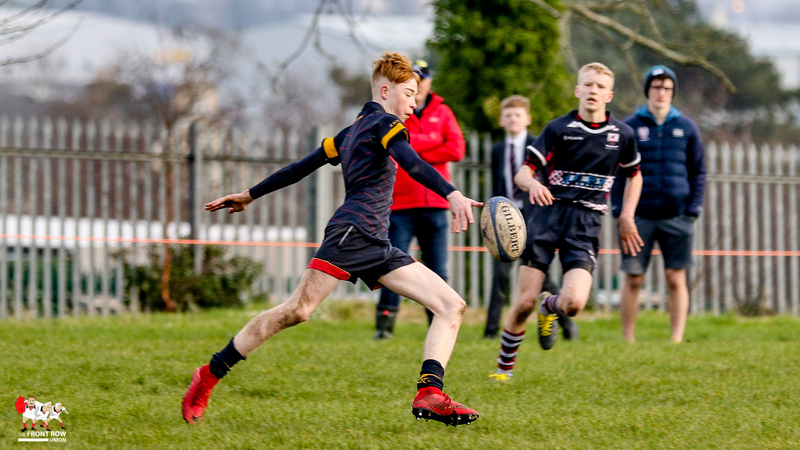 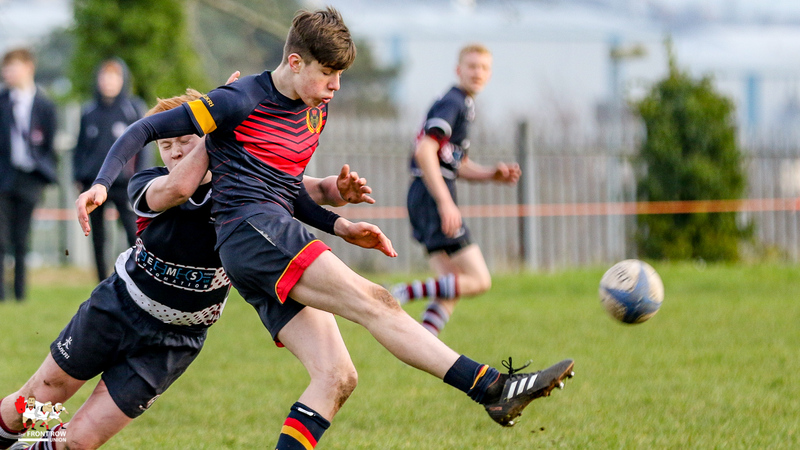 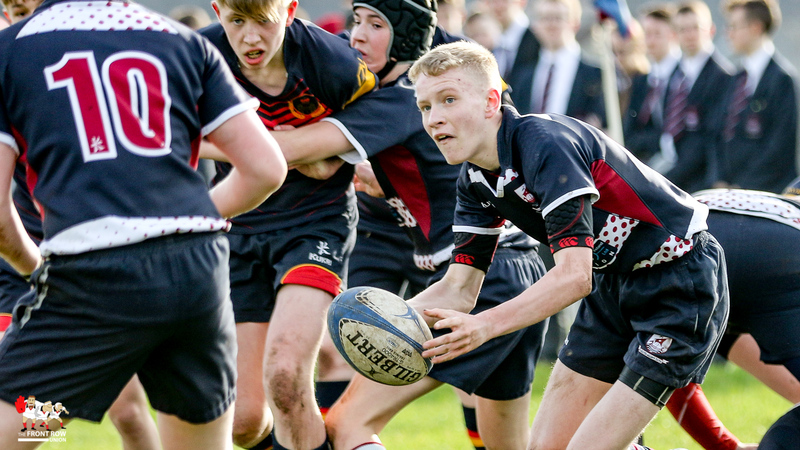 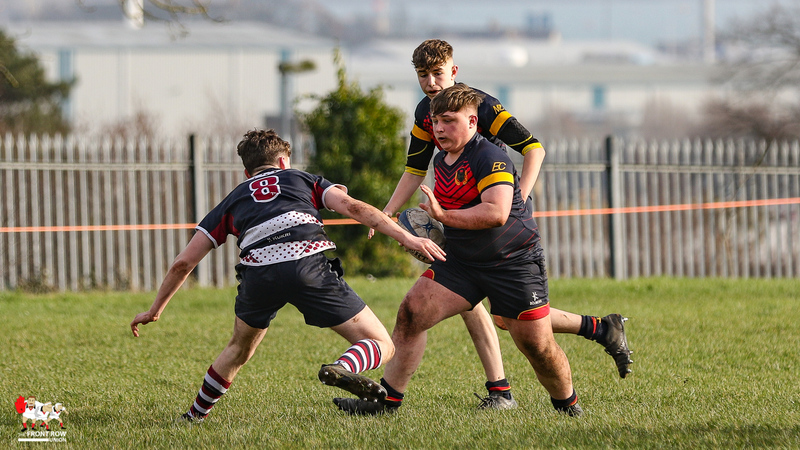 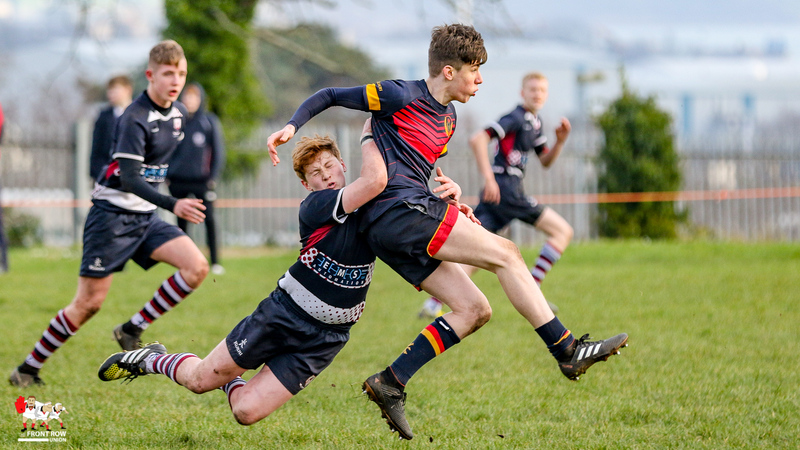 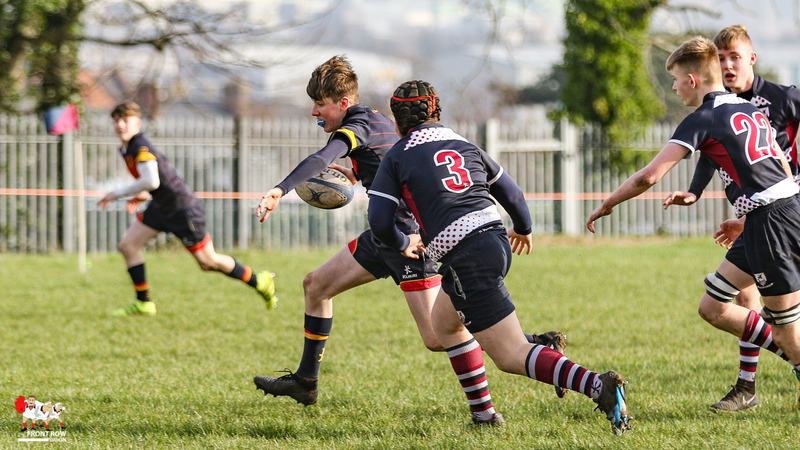 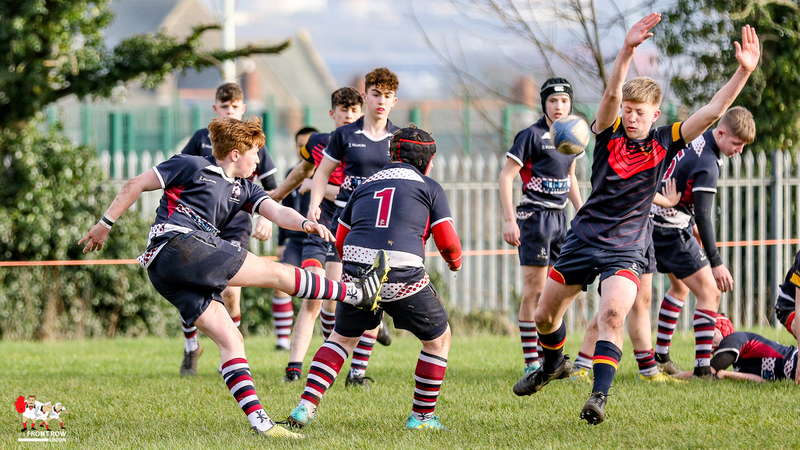 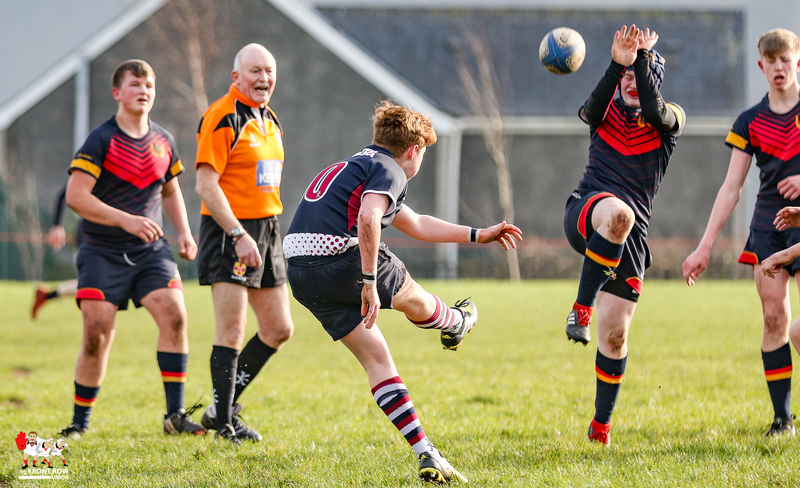 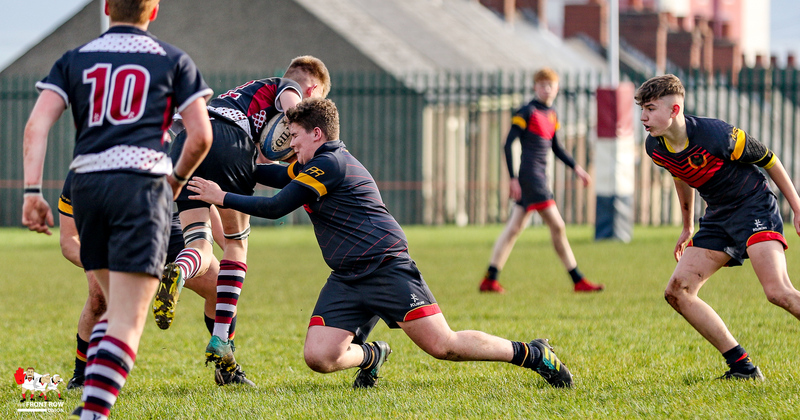 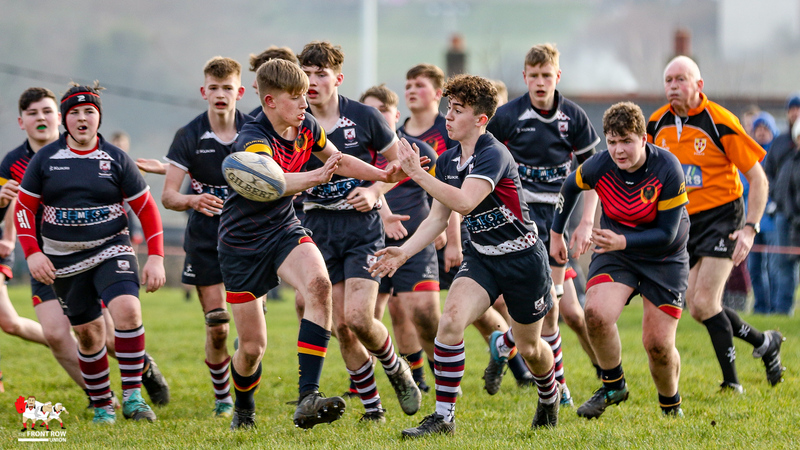 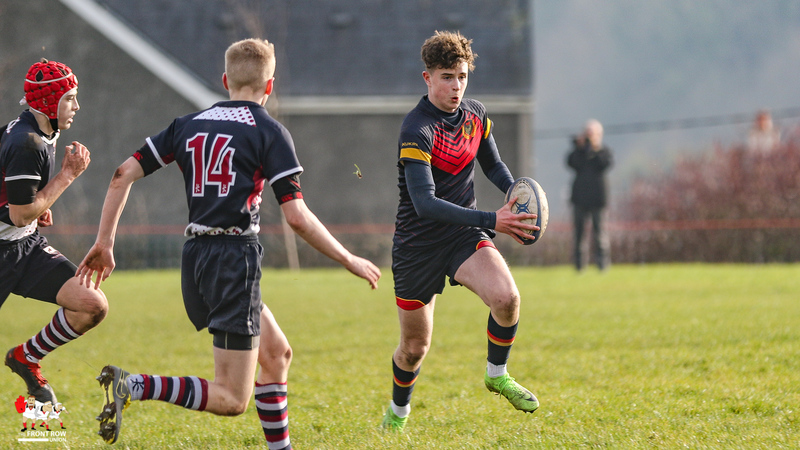 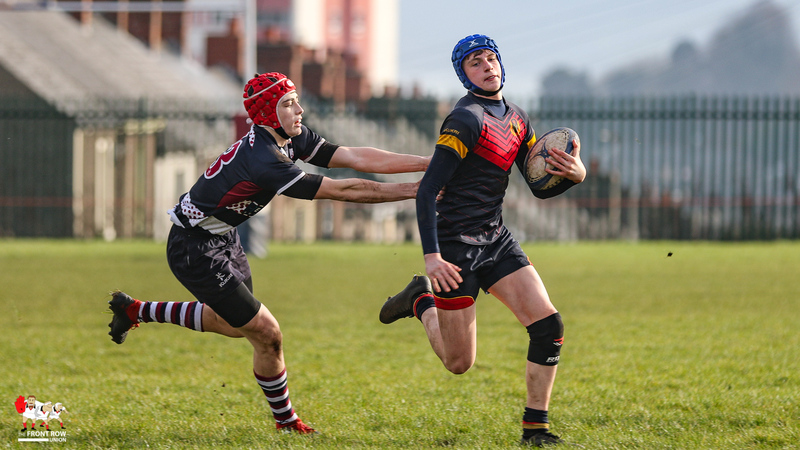 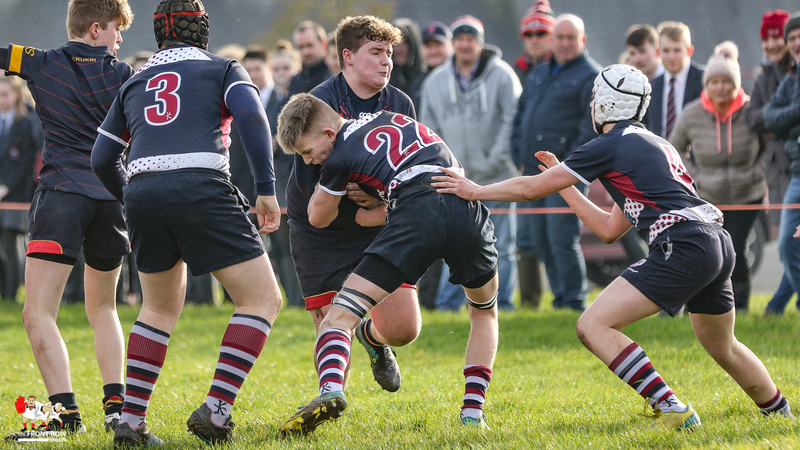 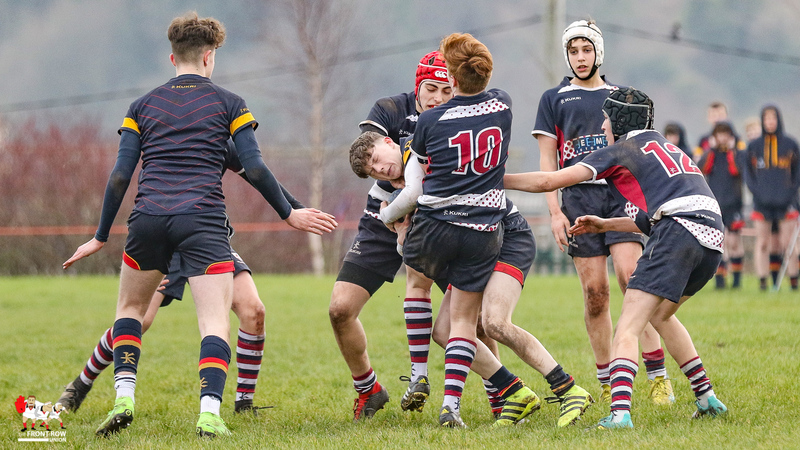 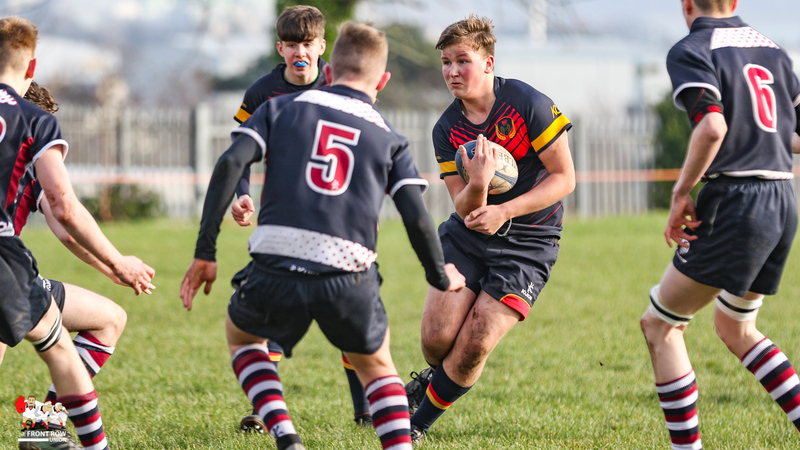 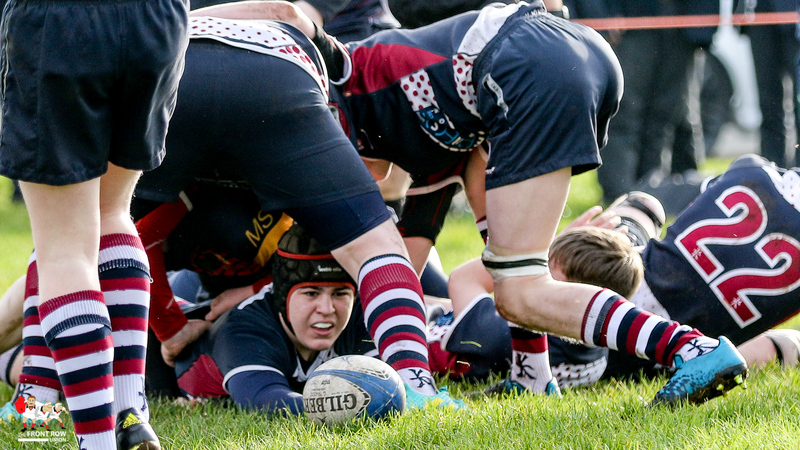 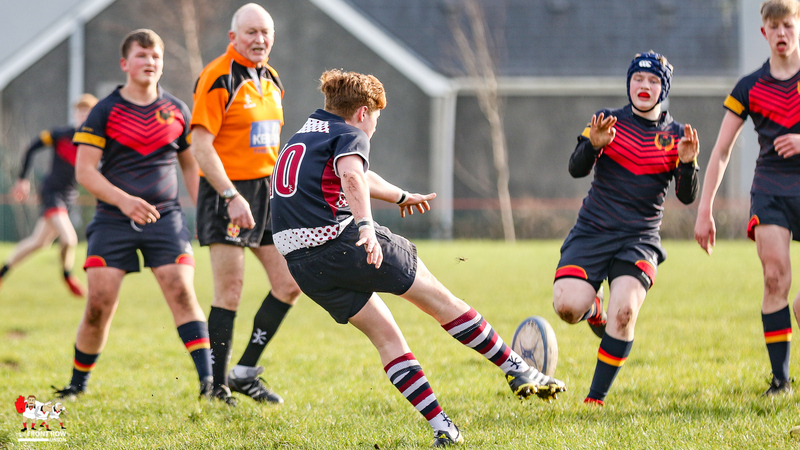 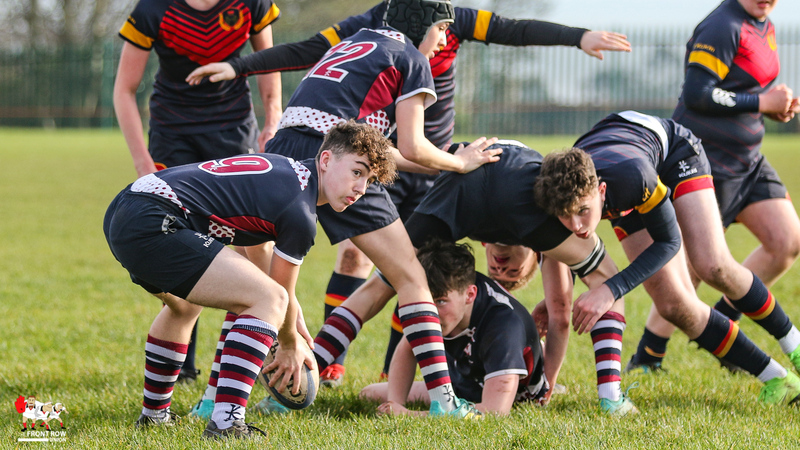 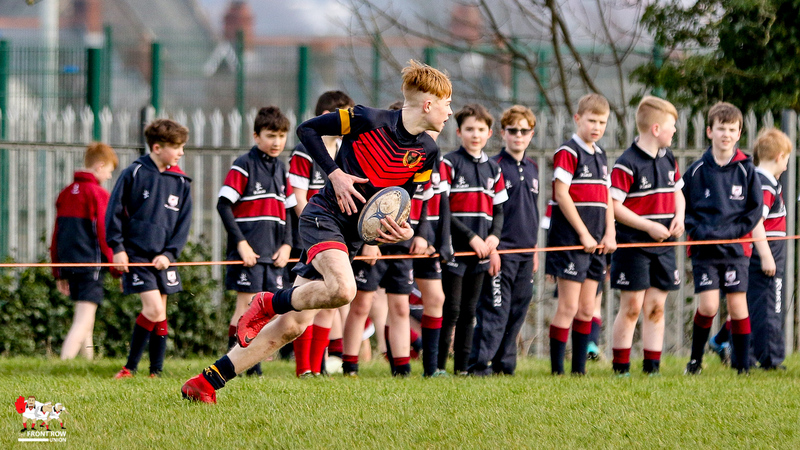 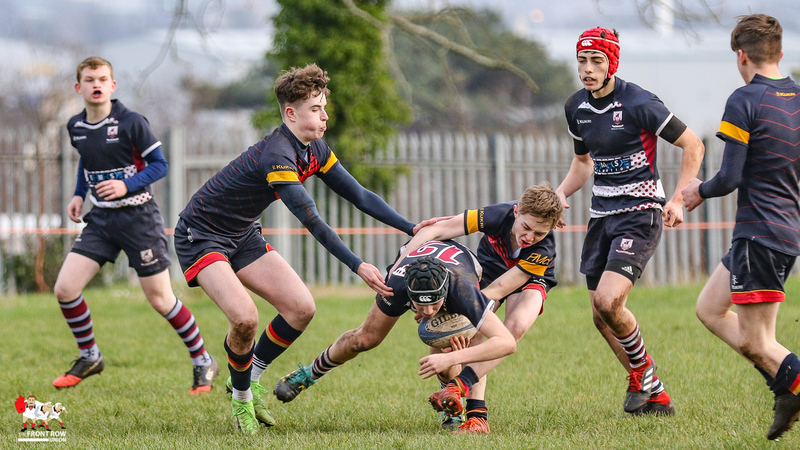 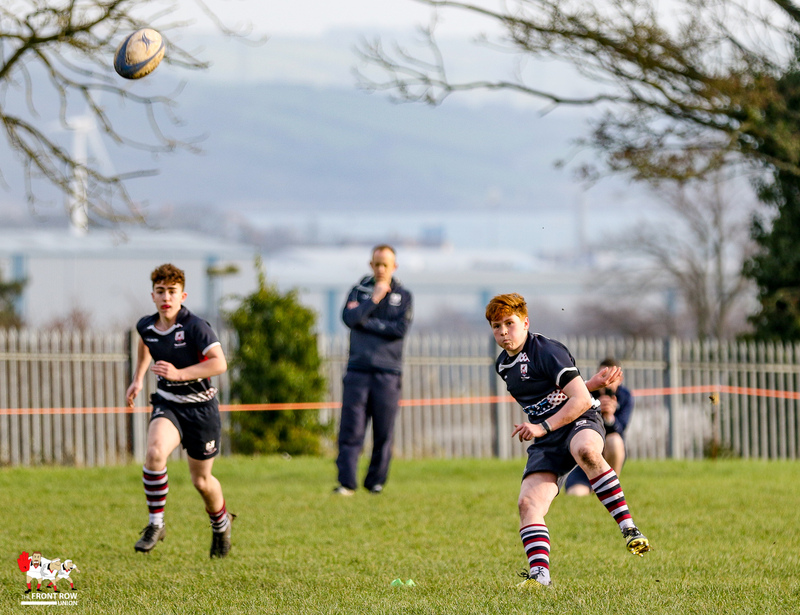 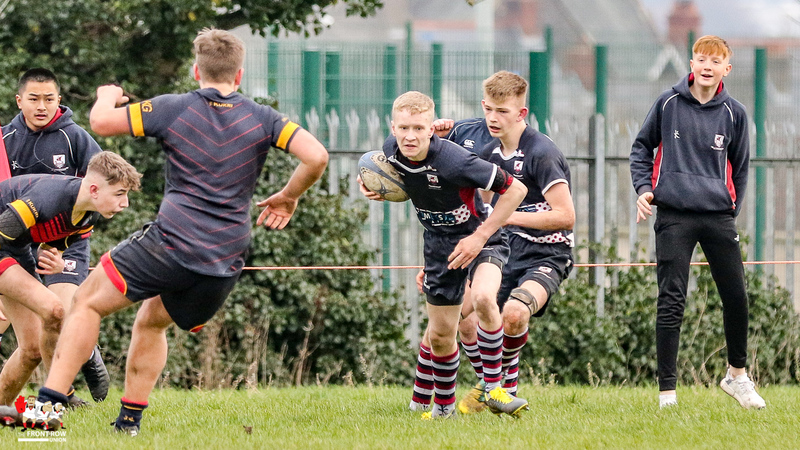 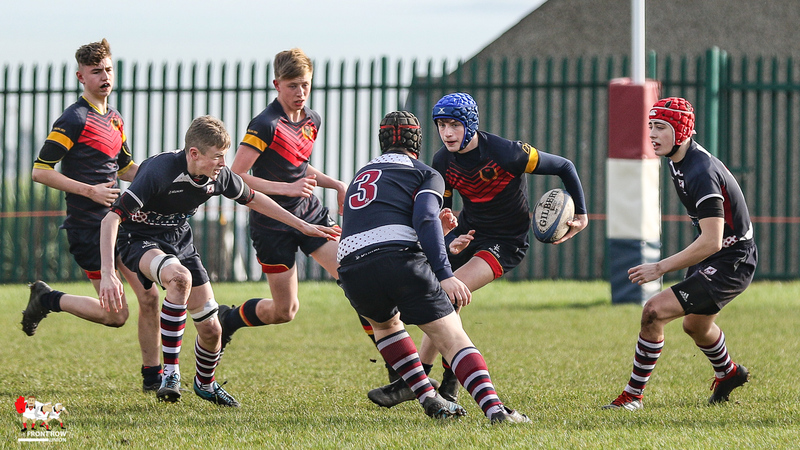 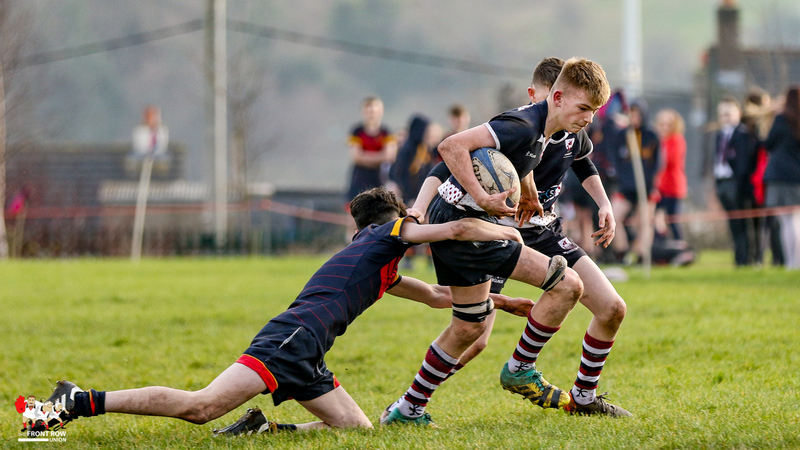 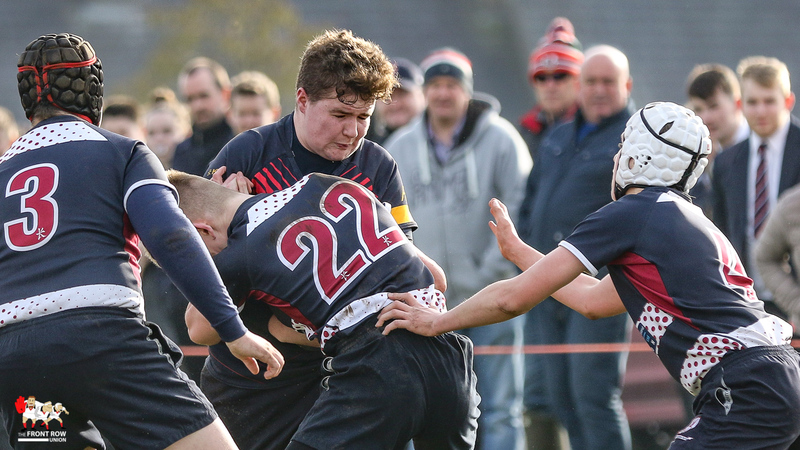 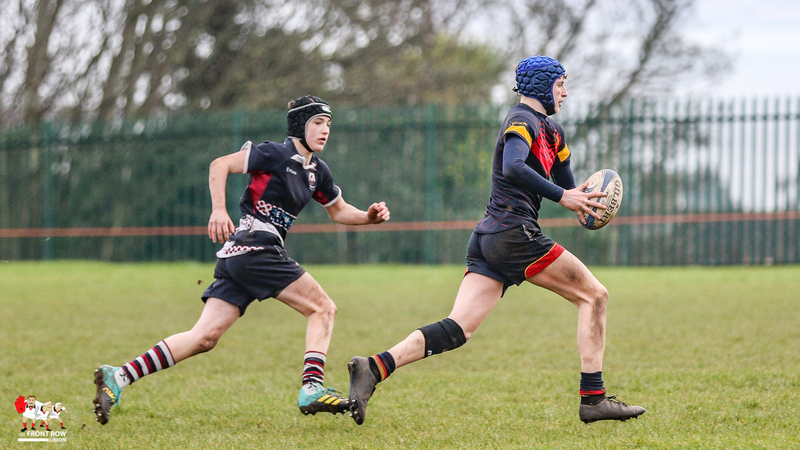 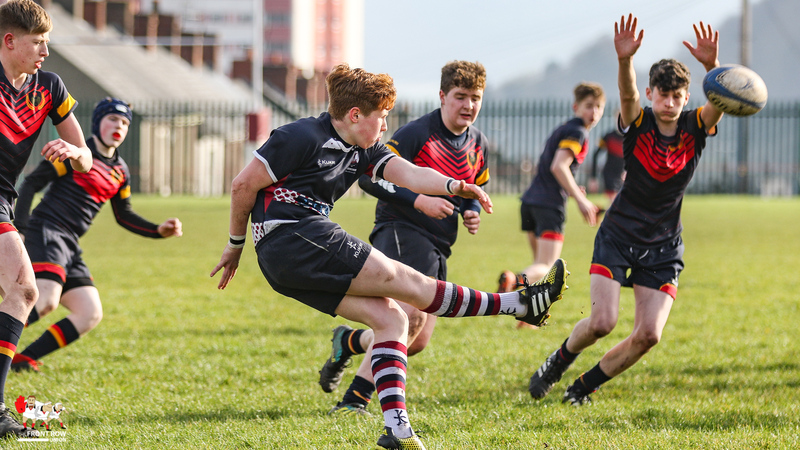 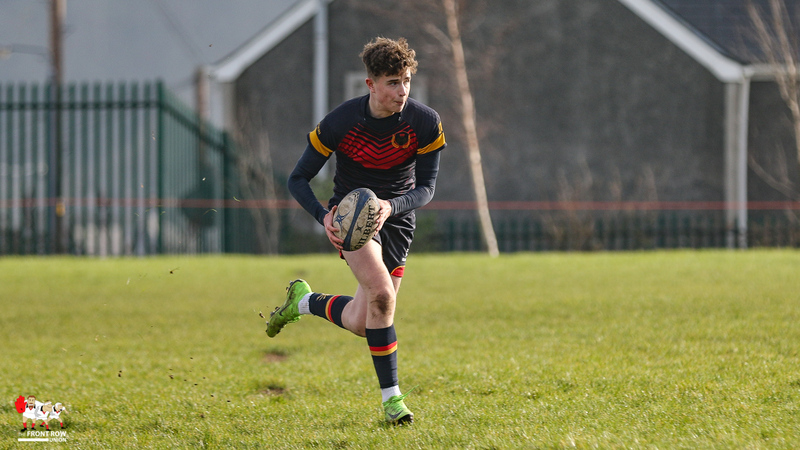 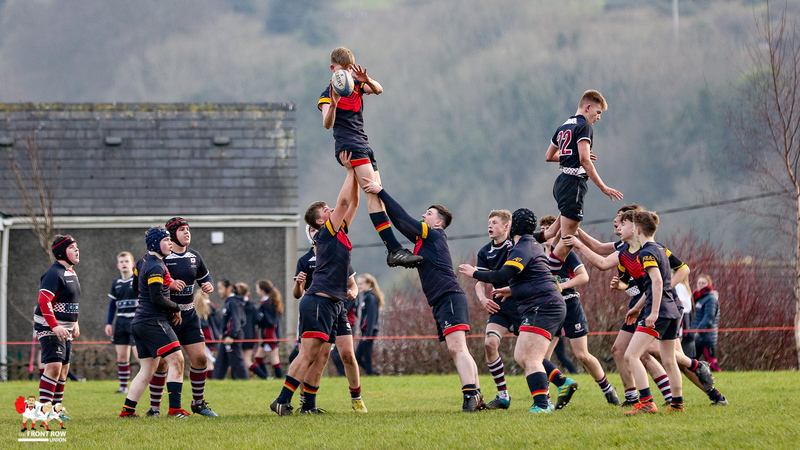 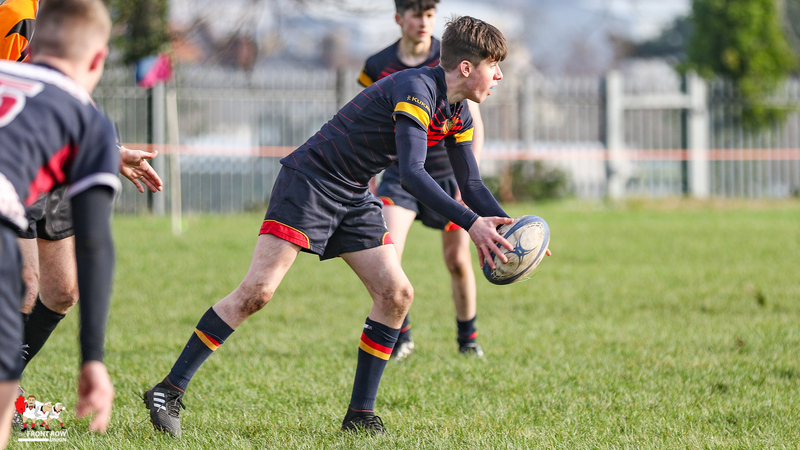 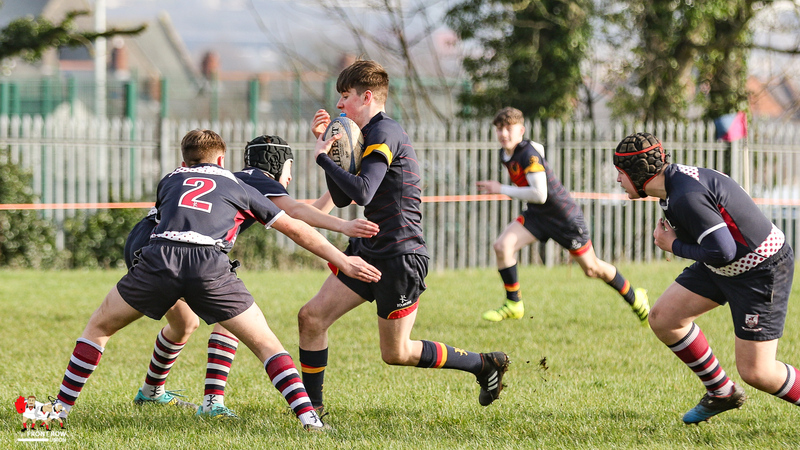 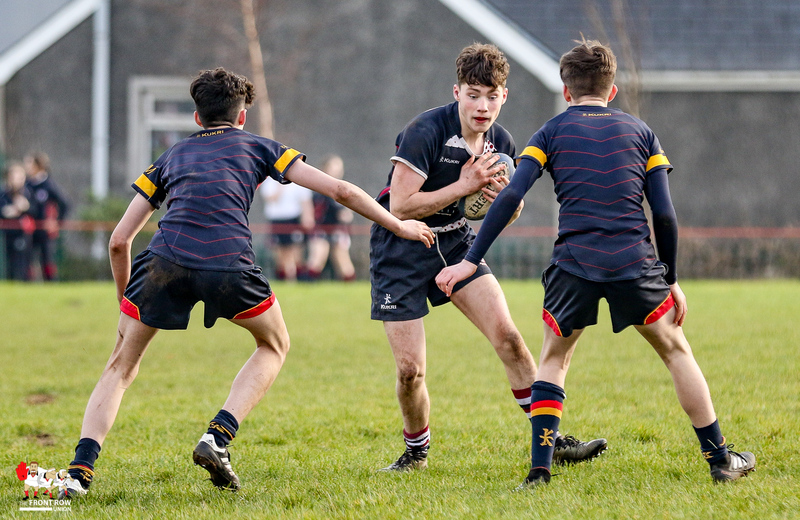 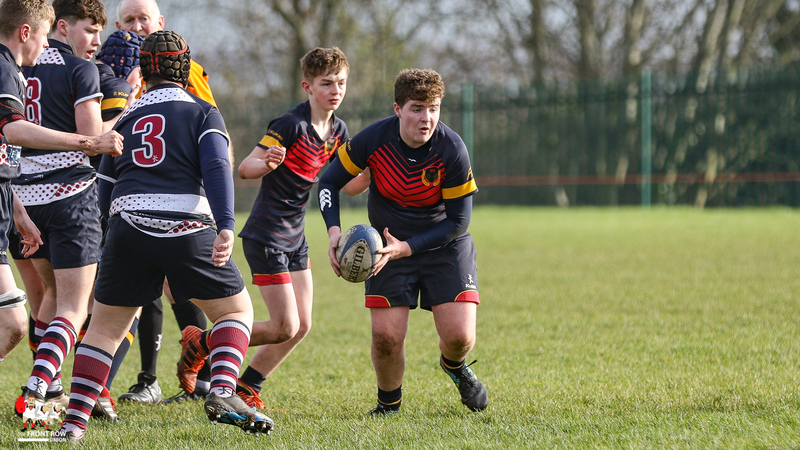 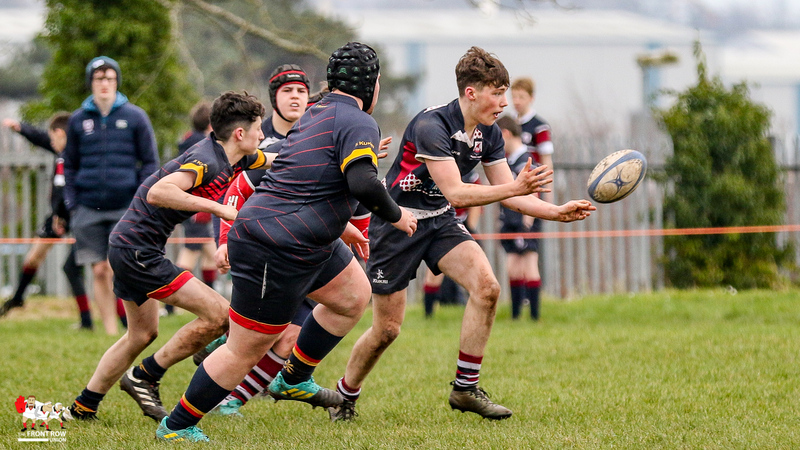 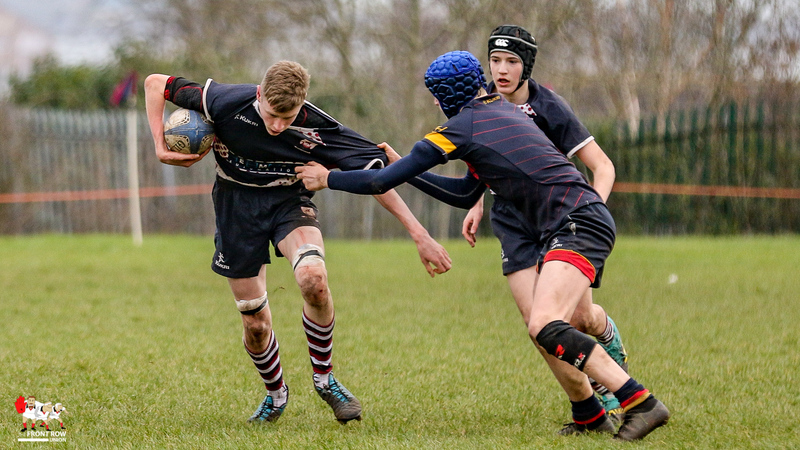 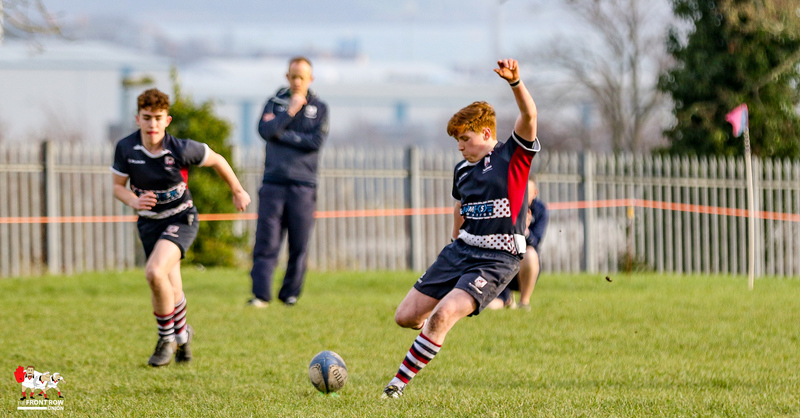 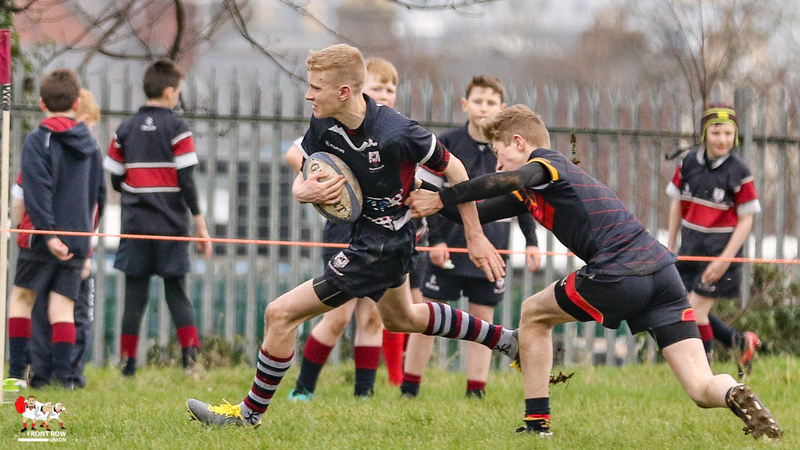 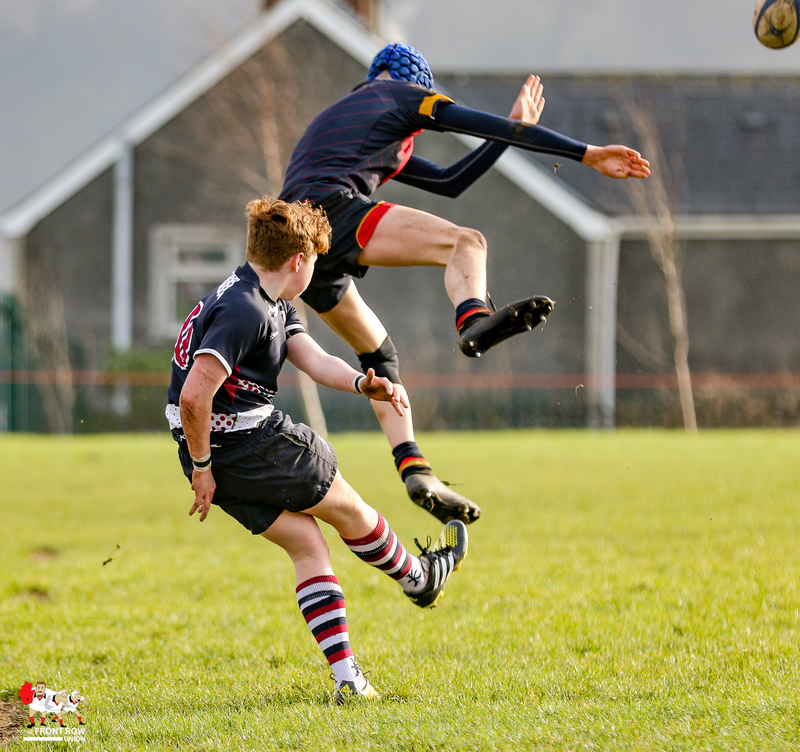 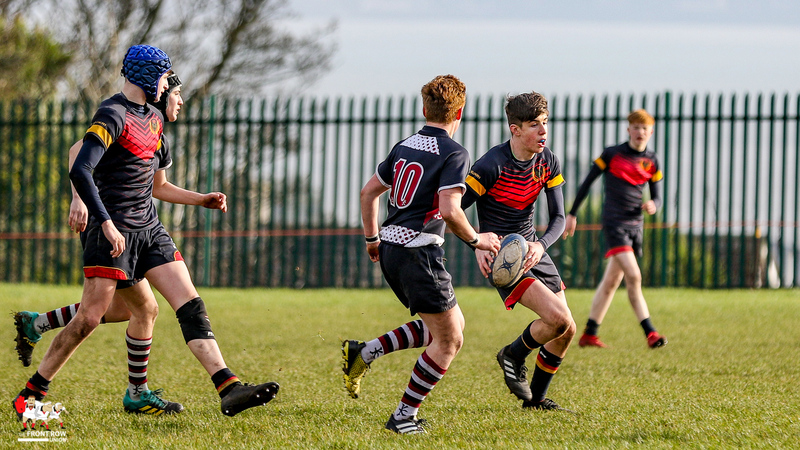 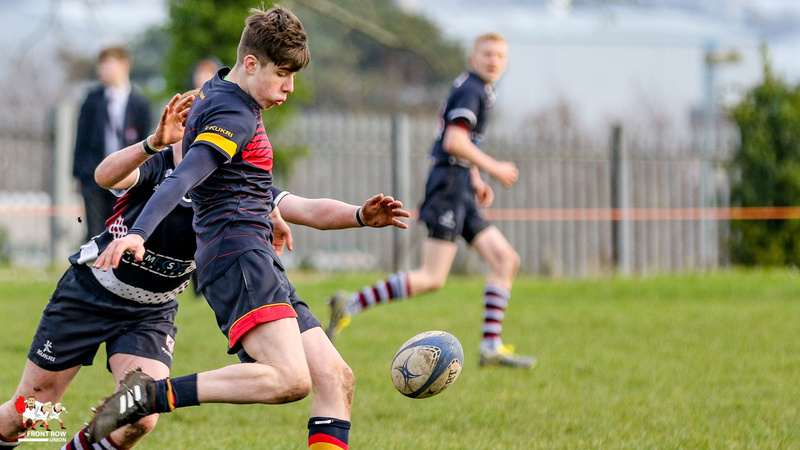 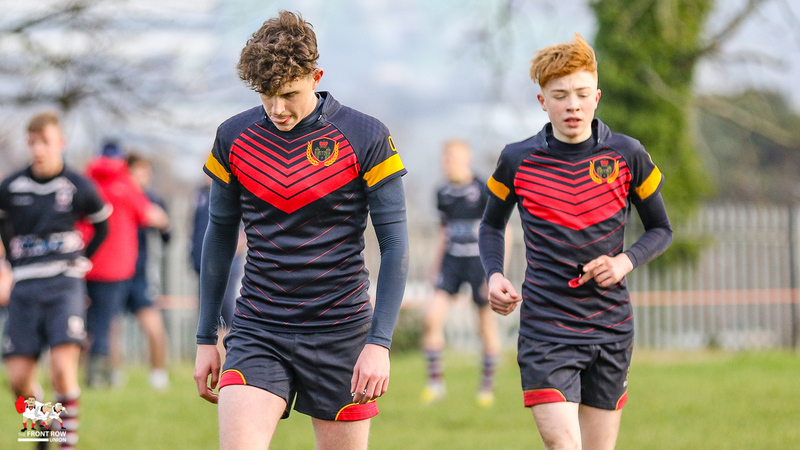 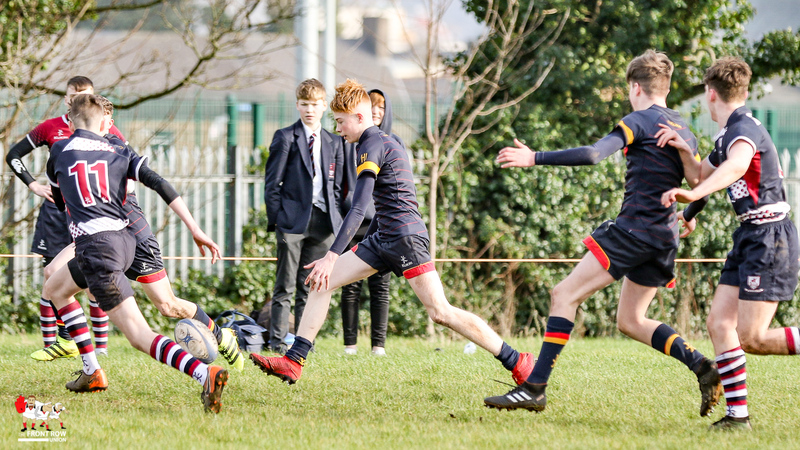 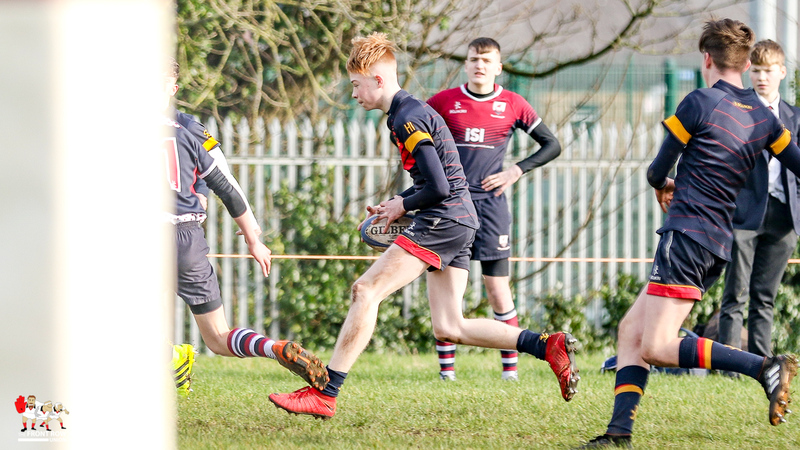 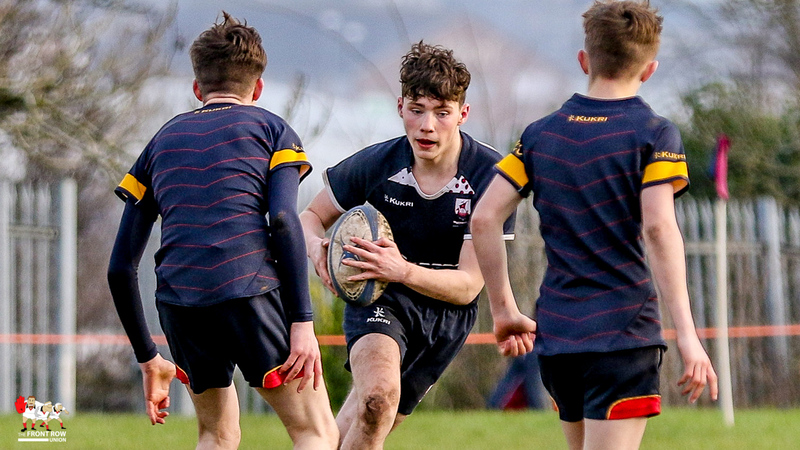 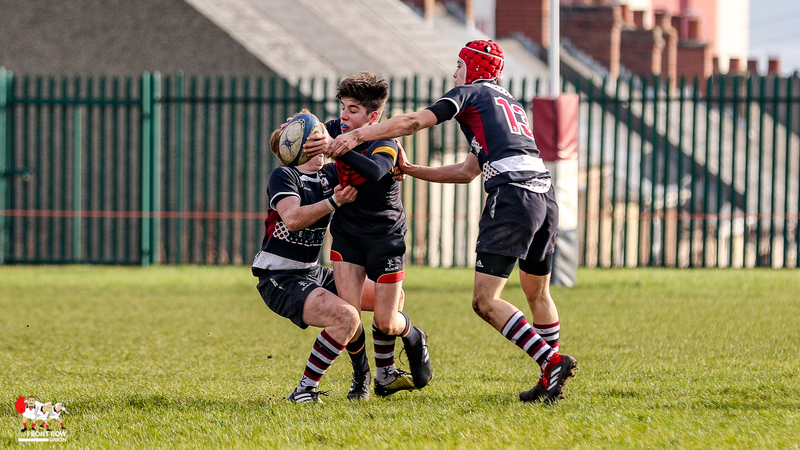 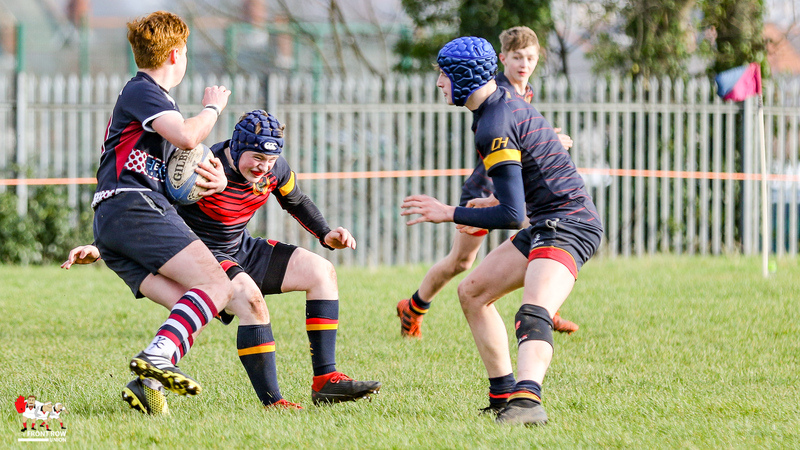 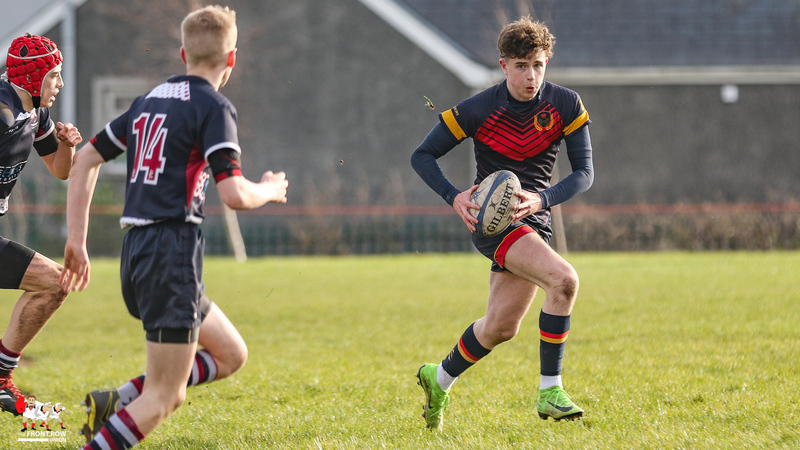 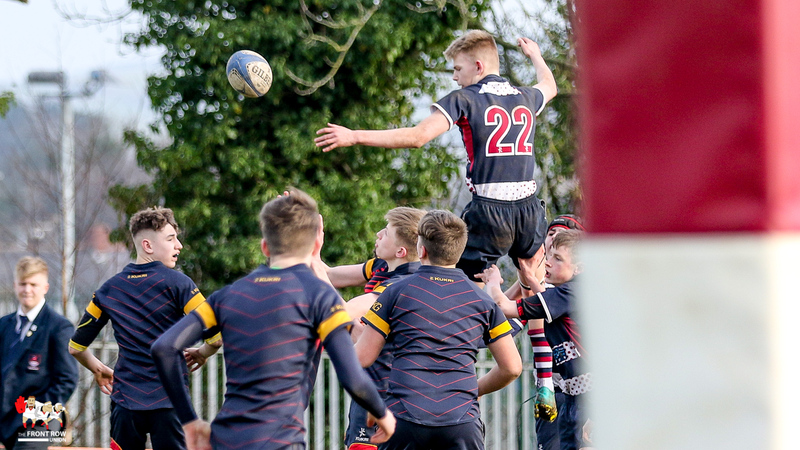 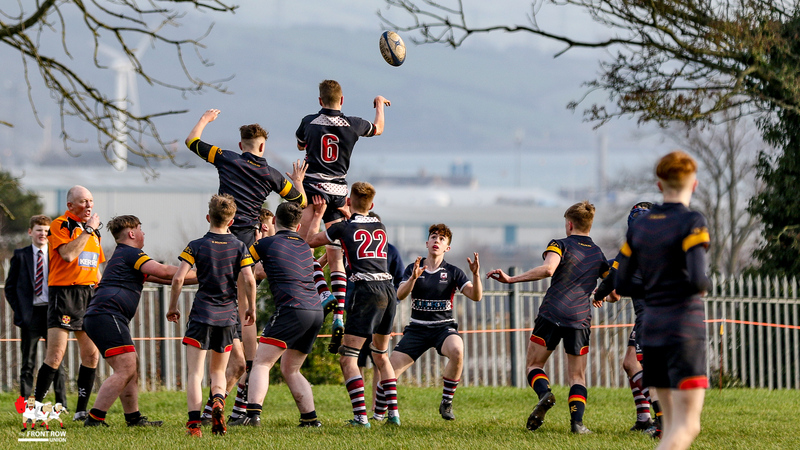 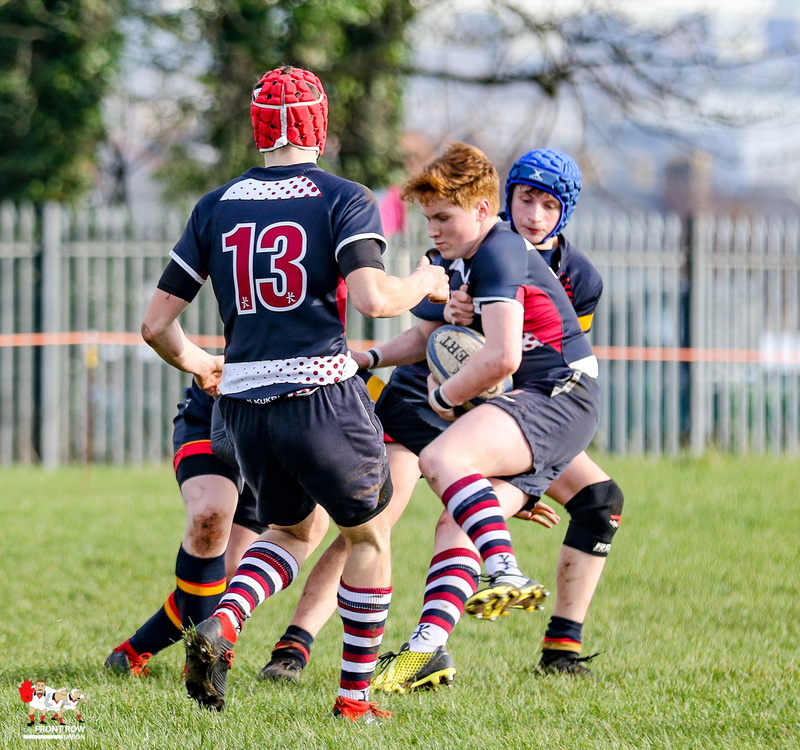 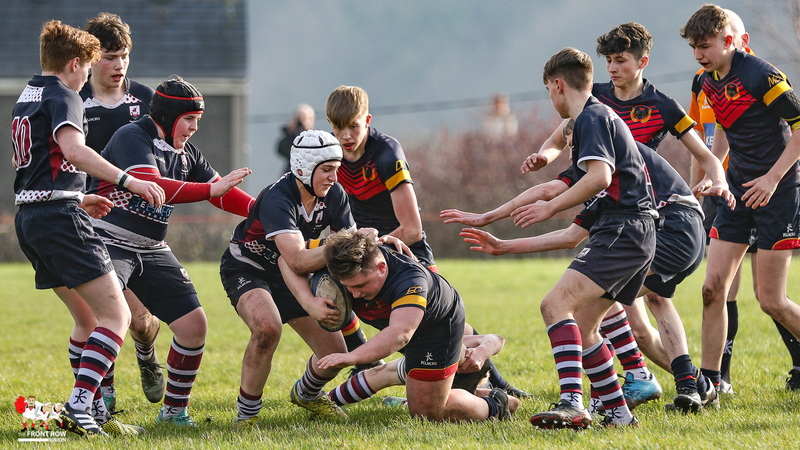 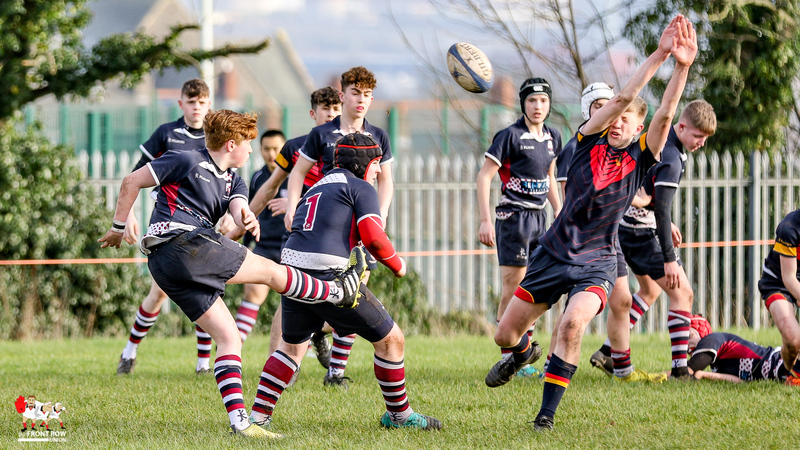 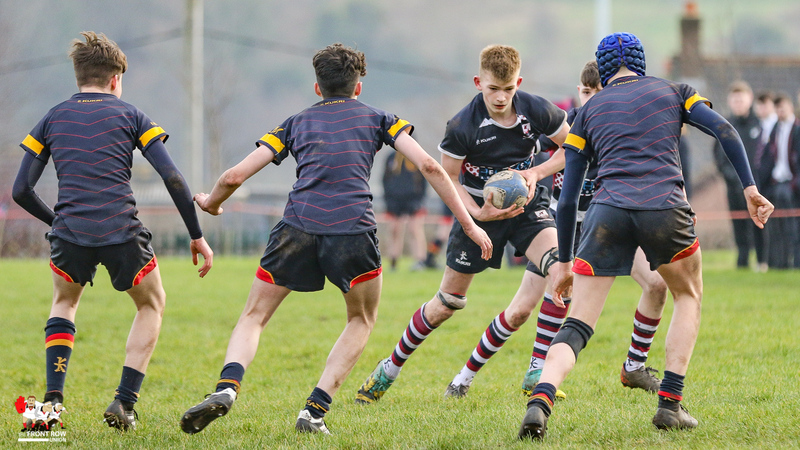 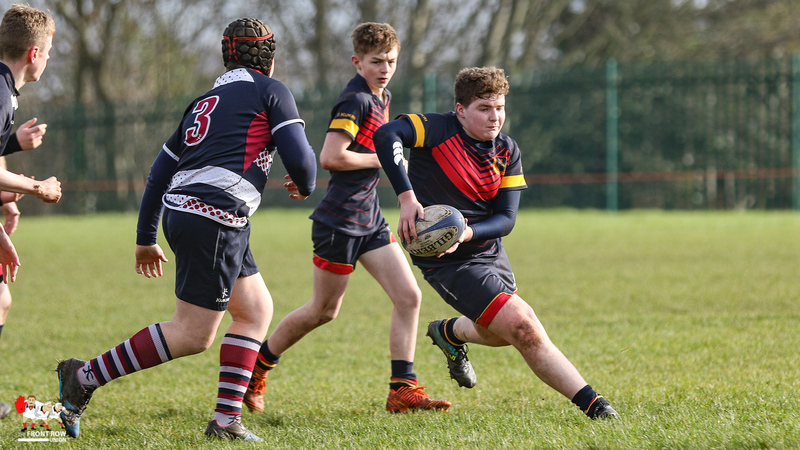 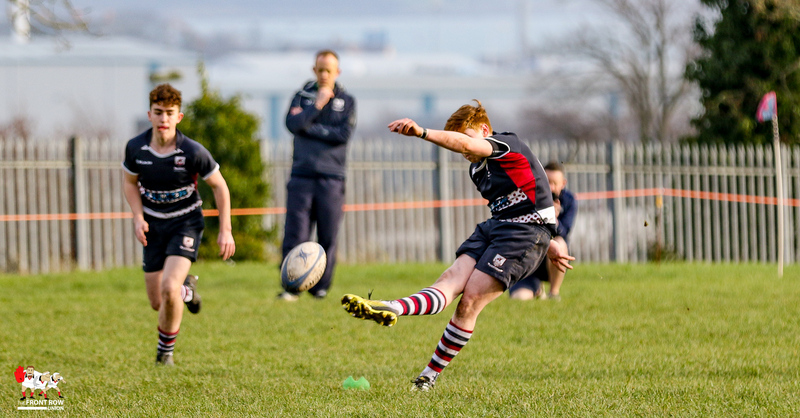 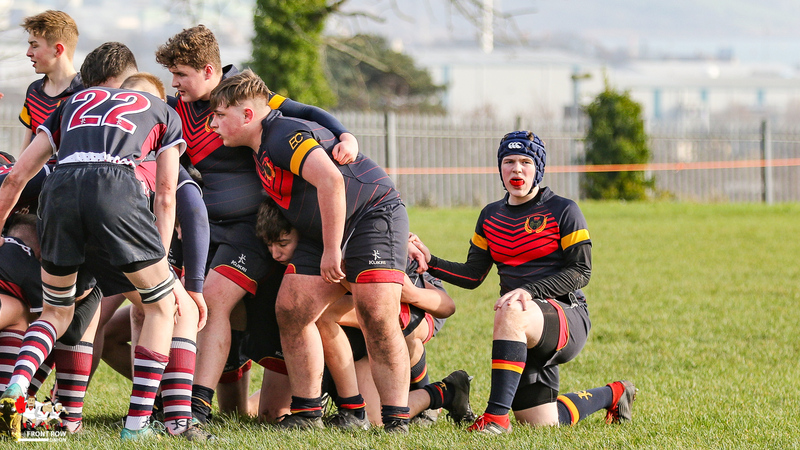 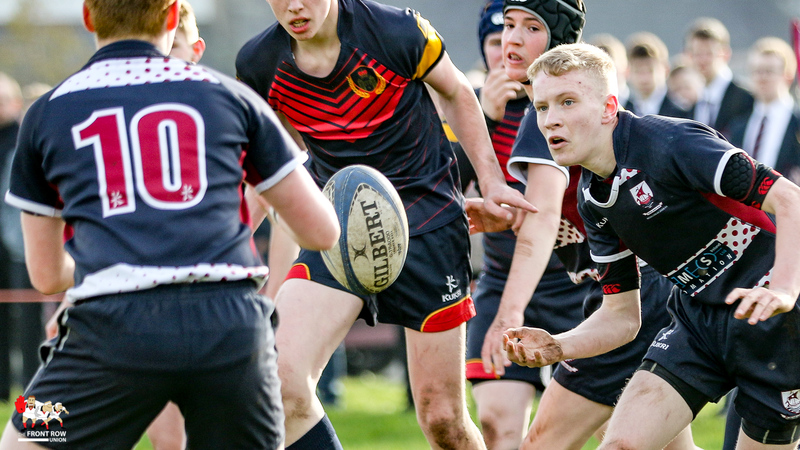 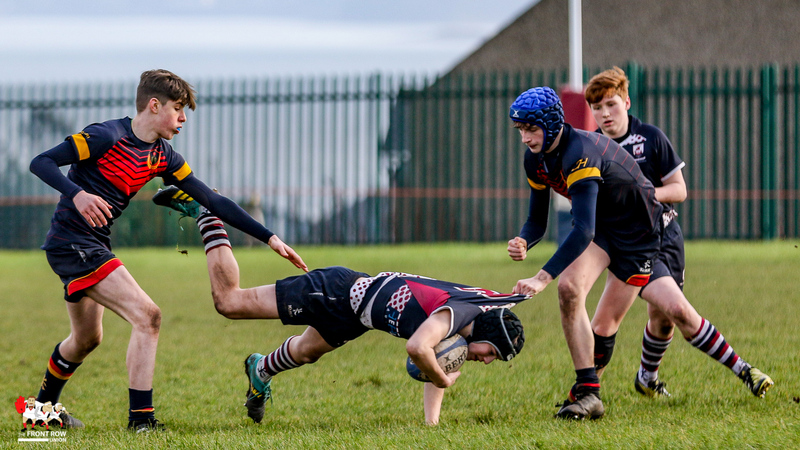 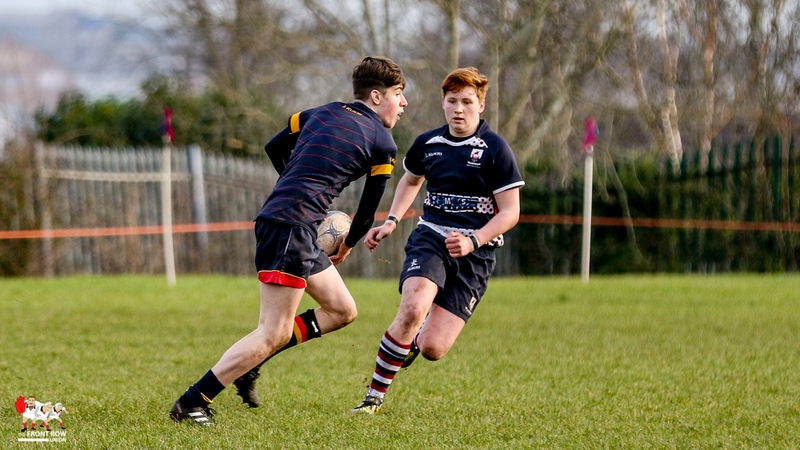 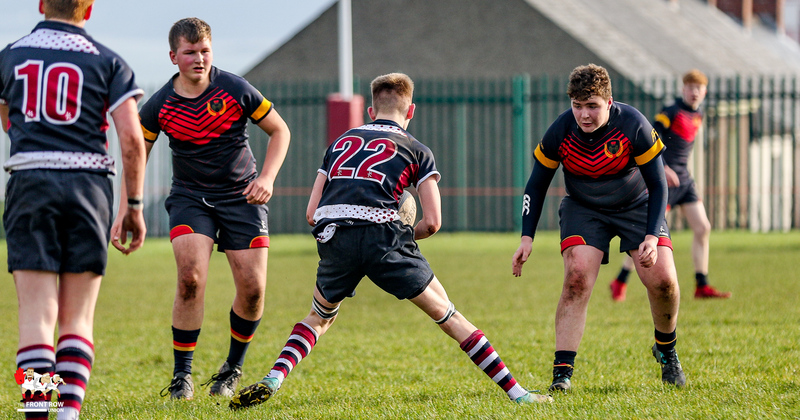 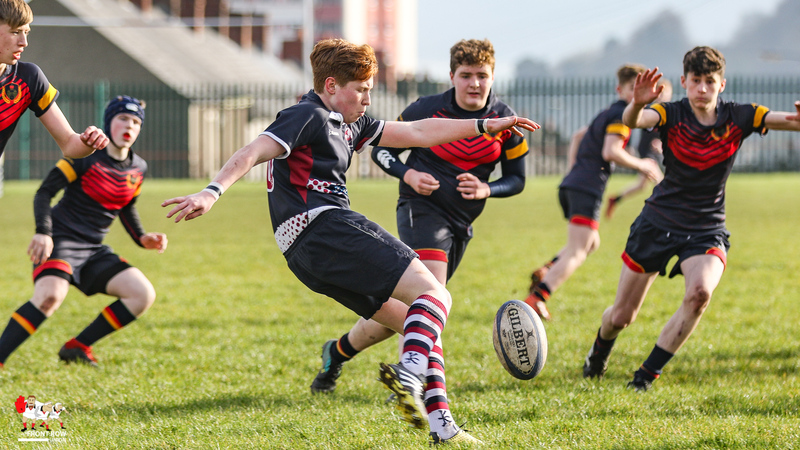 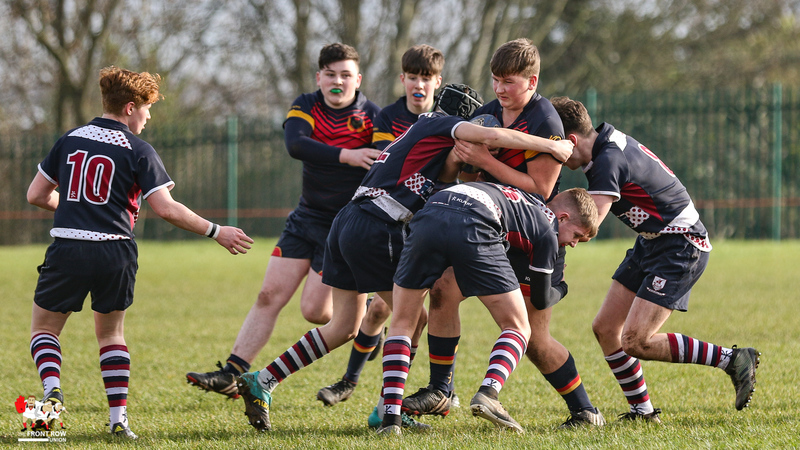 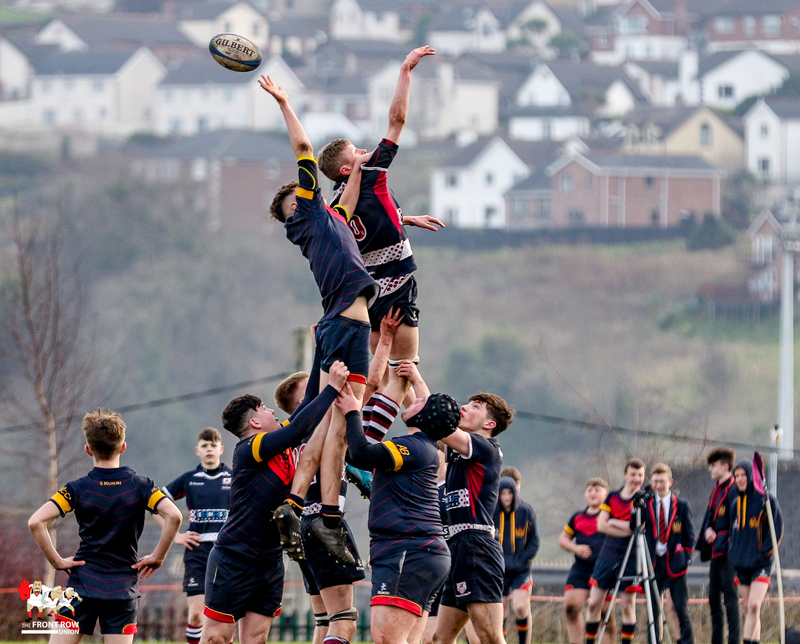 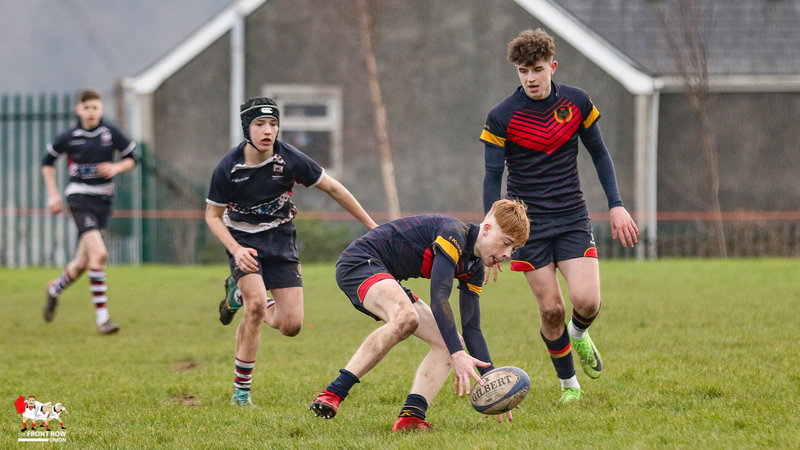 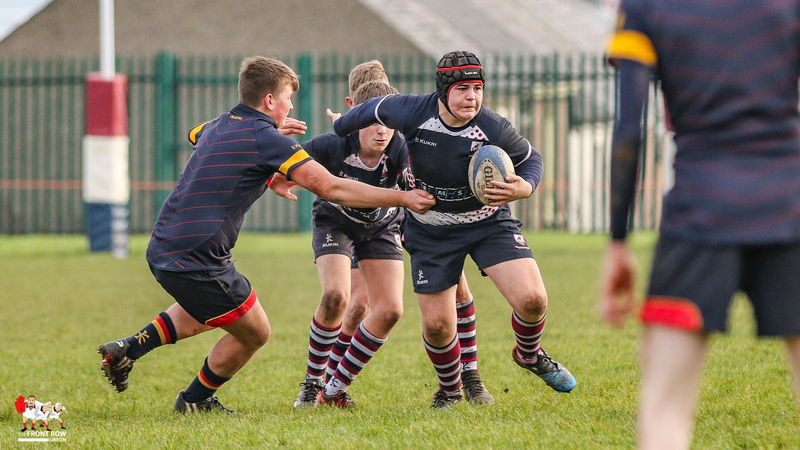 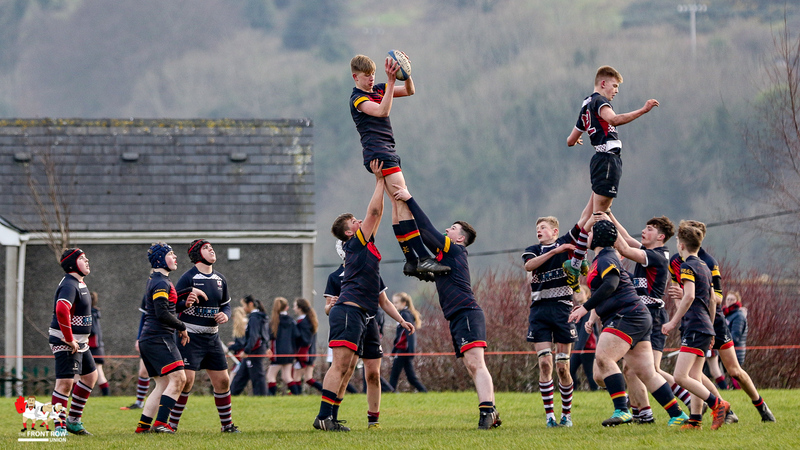 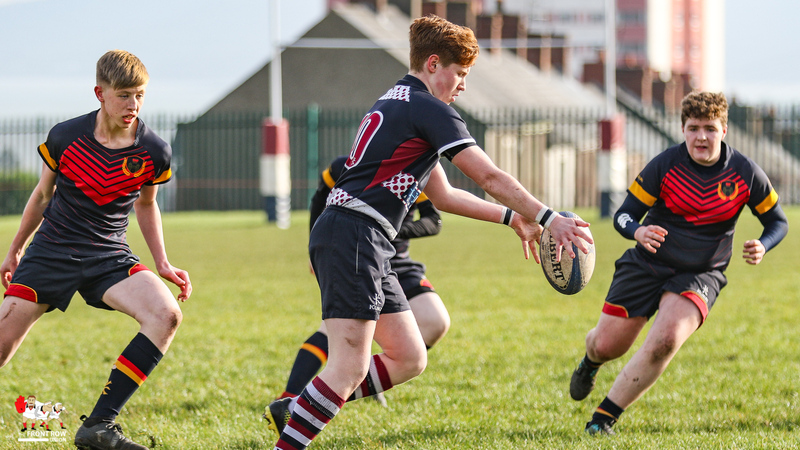 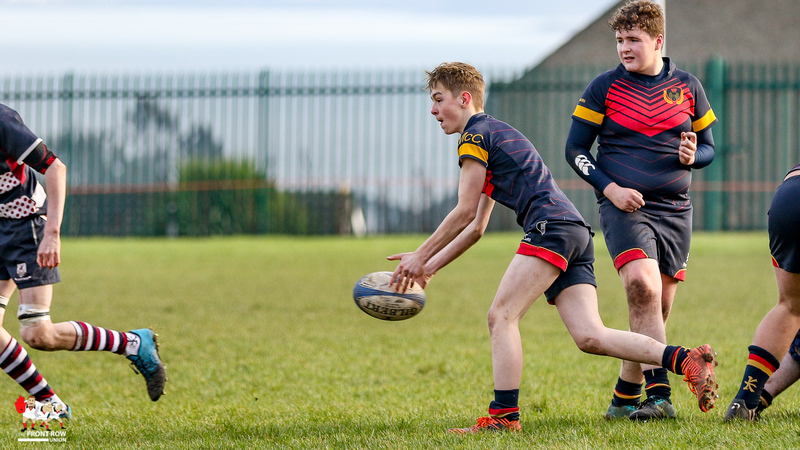 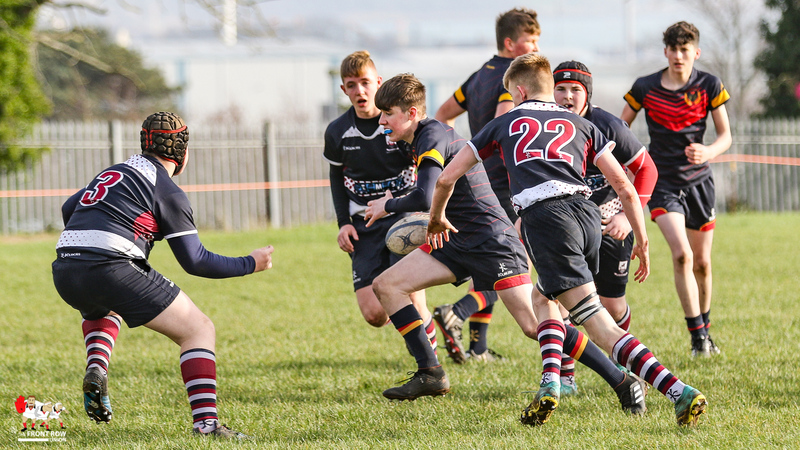 Larne Grammar hosted Enniskillen Royal Grammar on Friday afternoon in the Semi Final of the Medallion Trophy with the visitors progressing to the final following a 3 – 10 win. 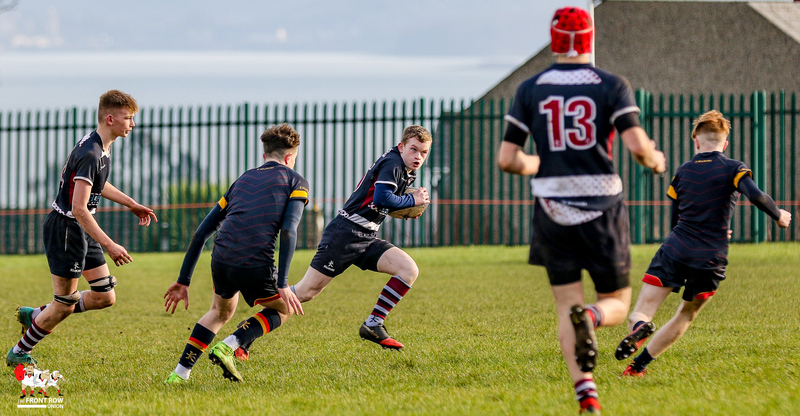 Enniskillen kicked off with a strong wind at their back but despite enjoying territorial advantage for most of the first quarter they were unable to break down the Larne defence. 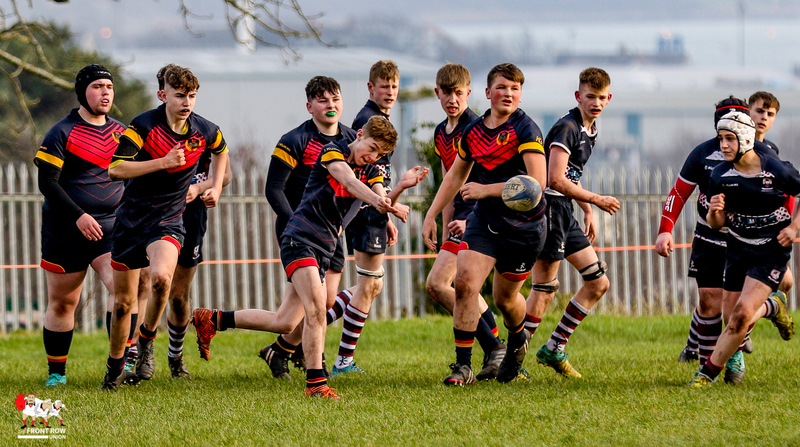 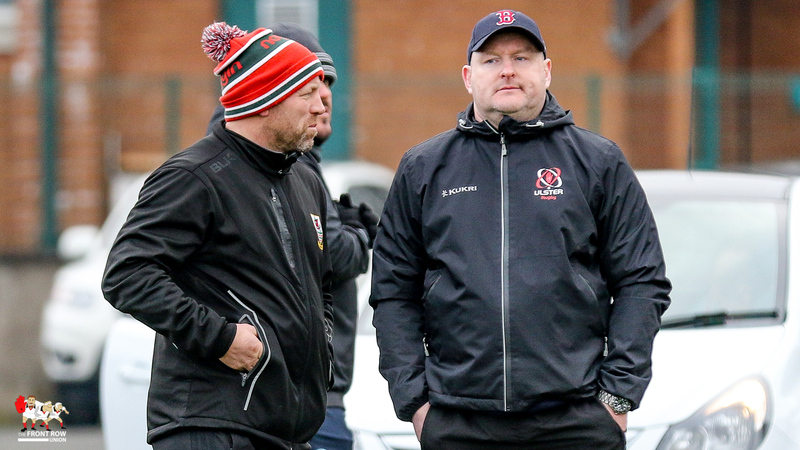 The hosts came more into the game in the second quarter and the tactical kicking of outhalf Robin Wynn saw Larne take the territorial advantage. 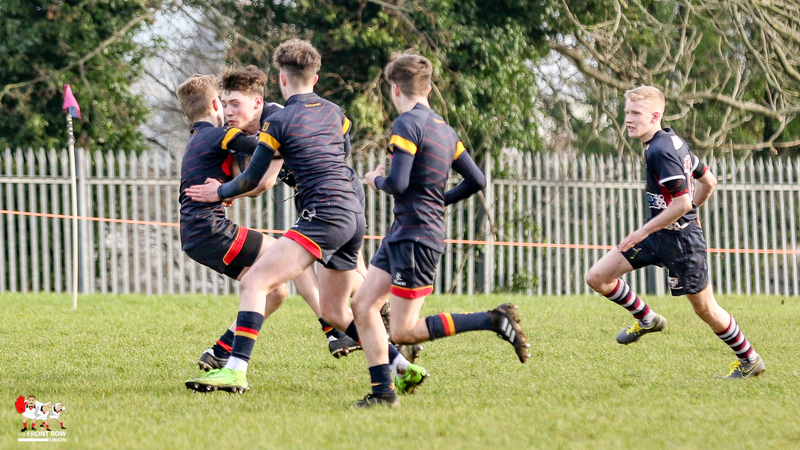 However the Enniskillen defence proved equally resolute and the teams turned round without the scoreboard being troubled. 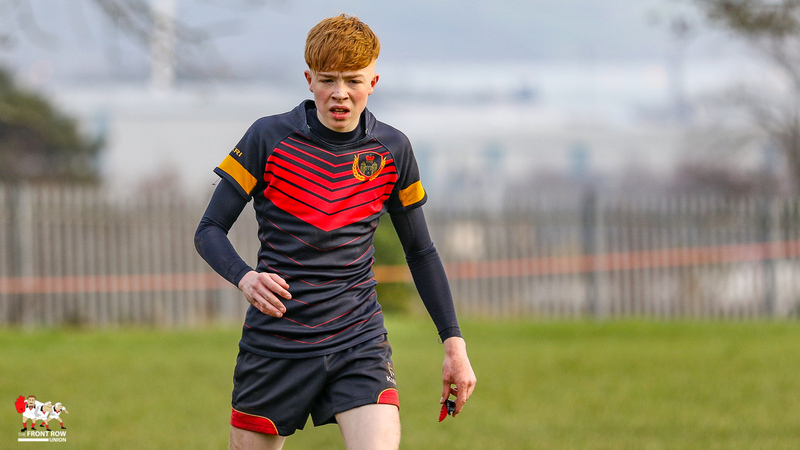 Larne continued to press at the start of the second half and Wynn landed an early penalty to give the Co Antrim side a 3 – 0 lead. 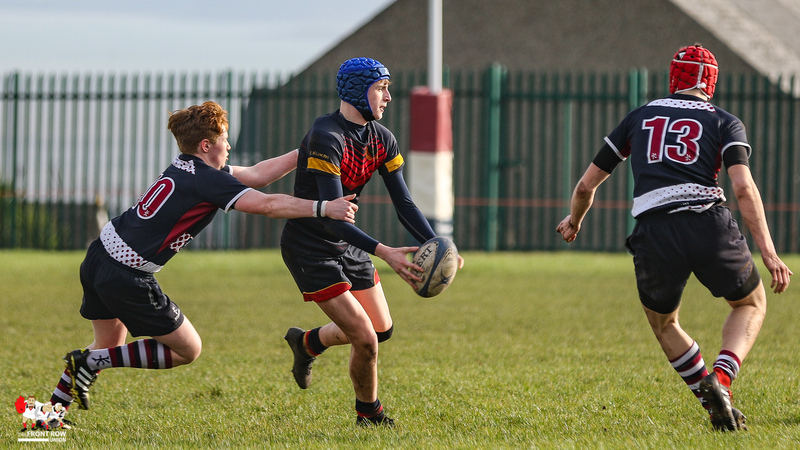 However, while Larne looked to be controlling the teritorial game the visitors looked dangerous with the ball in hand and a break by Quilin Irvine ended with a try out wide to take the score to 3 – 5. 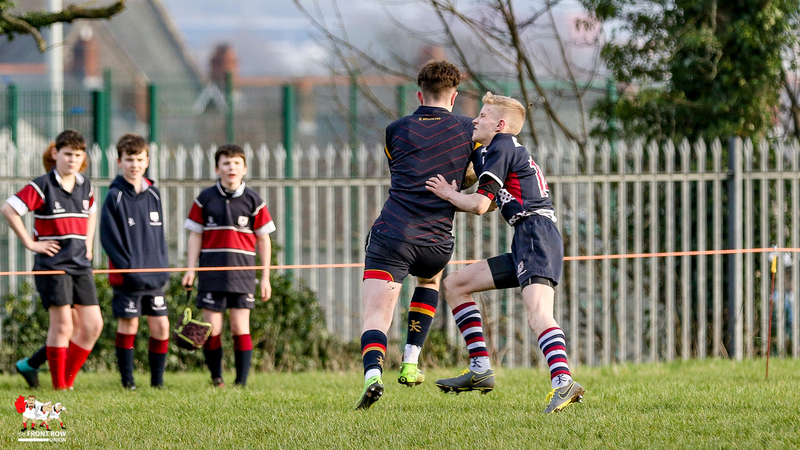 The teams continued to battle it out in the middle of the park as both sides looked for a decisive score. 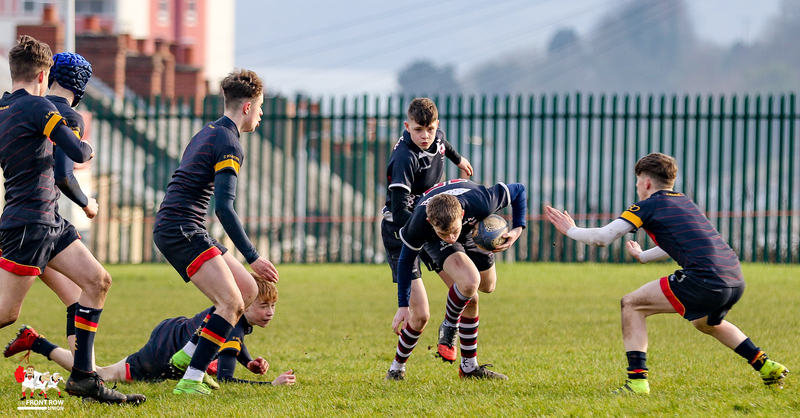 Unfortunately for the home side, it was Enniskillen who found their way to the try line for the second time with Devin Harron going over after a period of pressure in the Larne half. 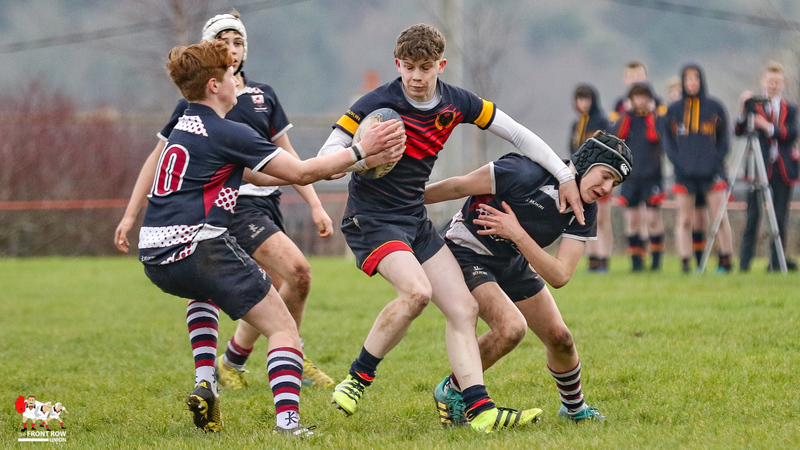 The conversion was missed in difficult conditions leaving the final score as Larne Grammar 3 Enniskillen Royal Grammar 10.